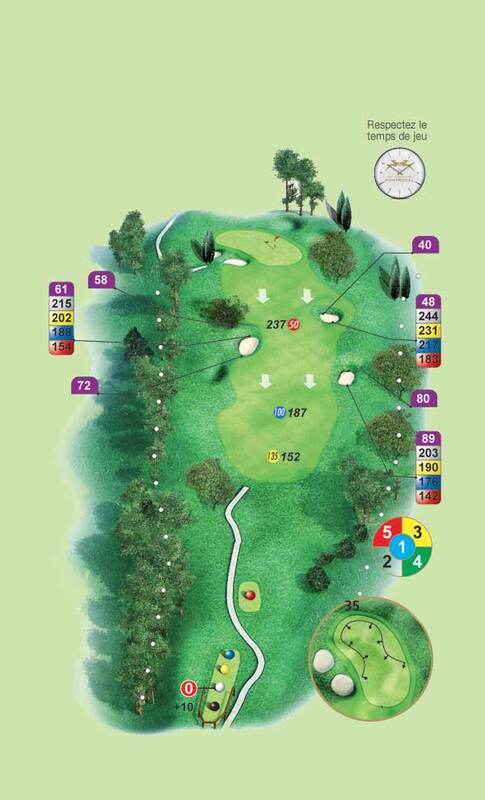 Strategy and prudence are essential for success on this difficult par 4 opening hole. 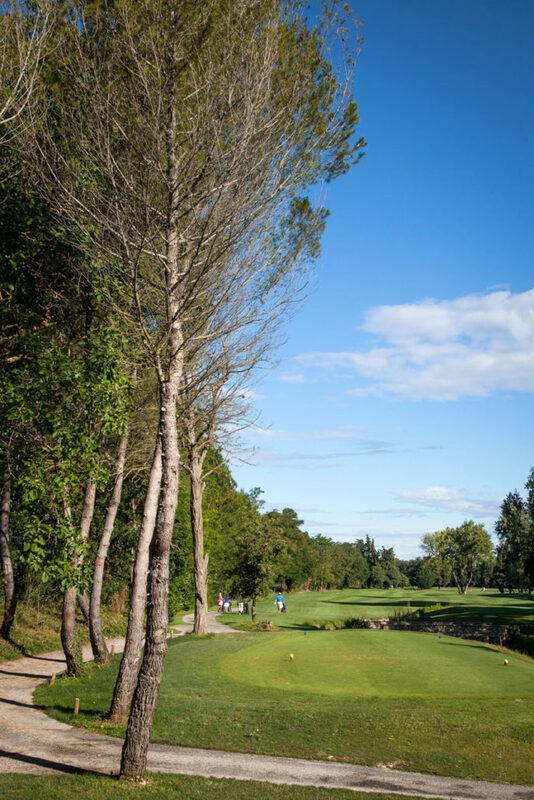 Hit a long drive is a risky option. 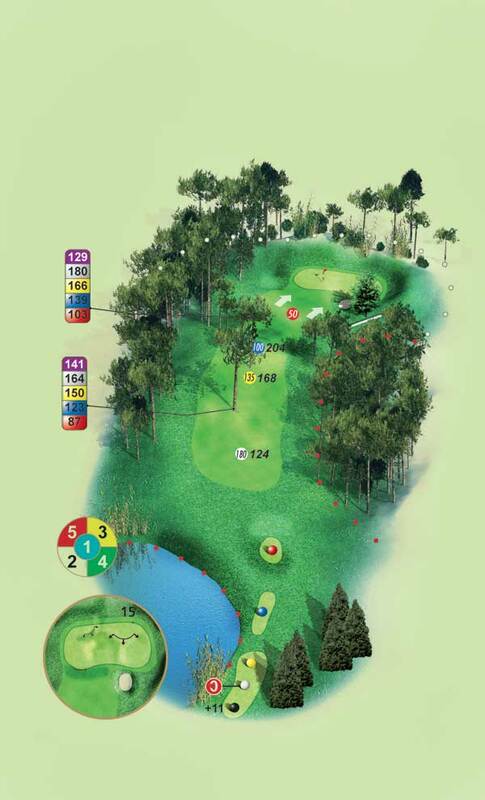 Better to place the ball on the left side of the fairway which extends down a slope towards the green. 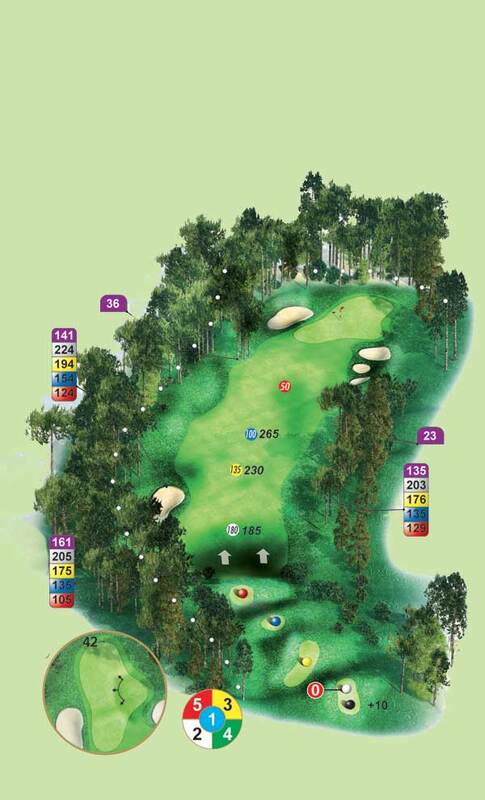 All shots on the right can descend into the wood leaving an almost impossible second shot. 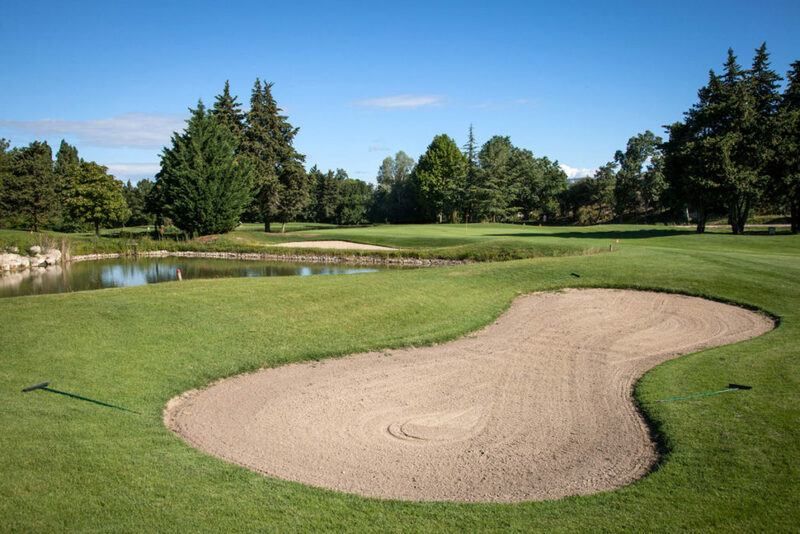 A well struck approach shot is required to reach a large green without much depth and protected at the front by a bunker. 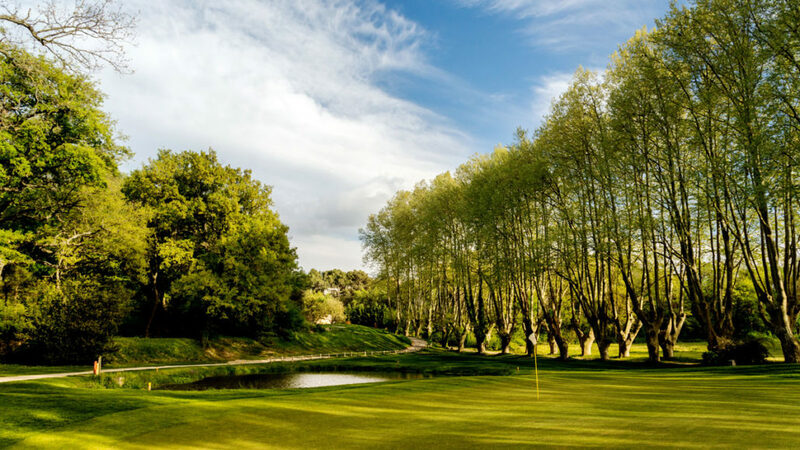 This is a par 3 bordered by 300 year old plane trees, more impressive than difficult. 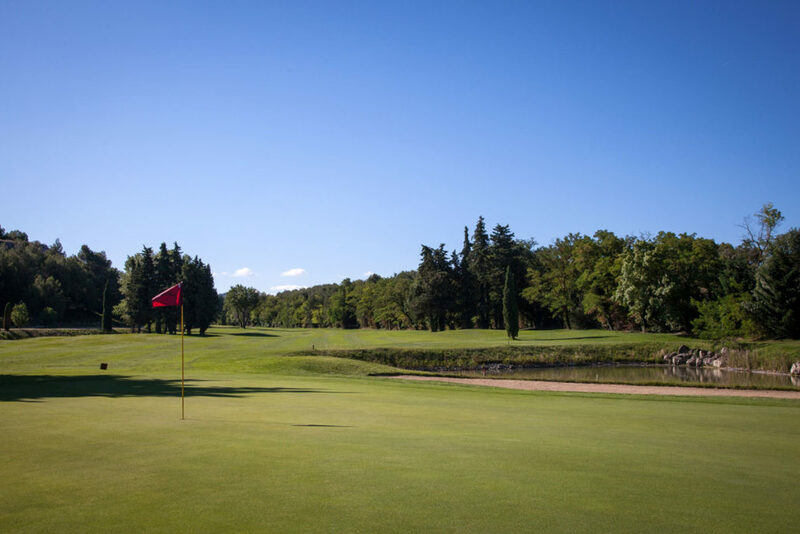 However out of bounds down the left extends behind the green and a lake in front with significant carry required and finally a large bunker on the left, all give a test of accuracy. 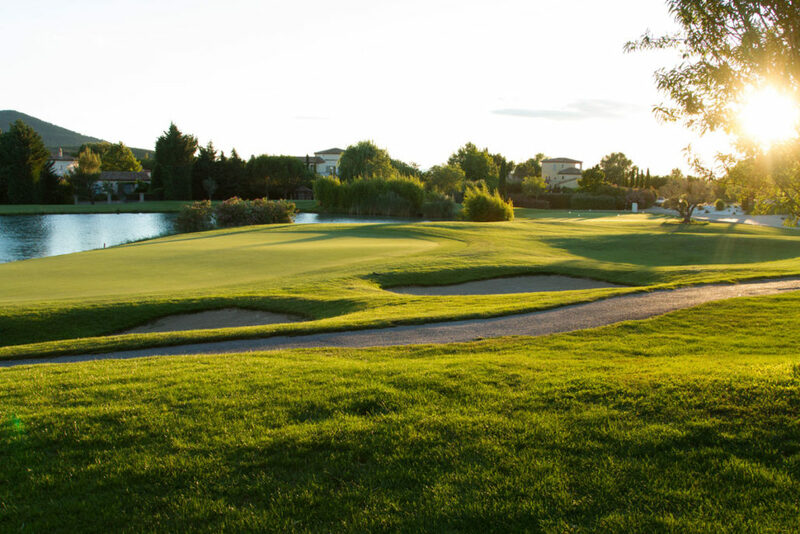 The gap between the bunker and the lake will be the place to aim for to secure reaching the centre of the green. 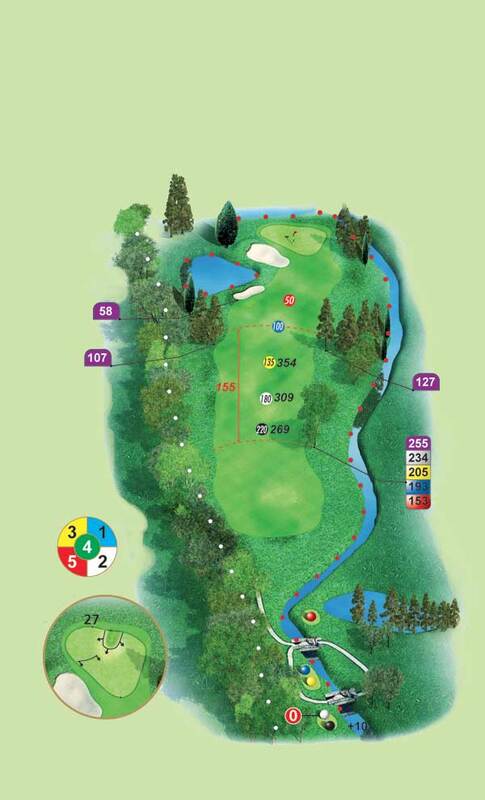 On this 382 metre par 4 the tee shot is the most important. 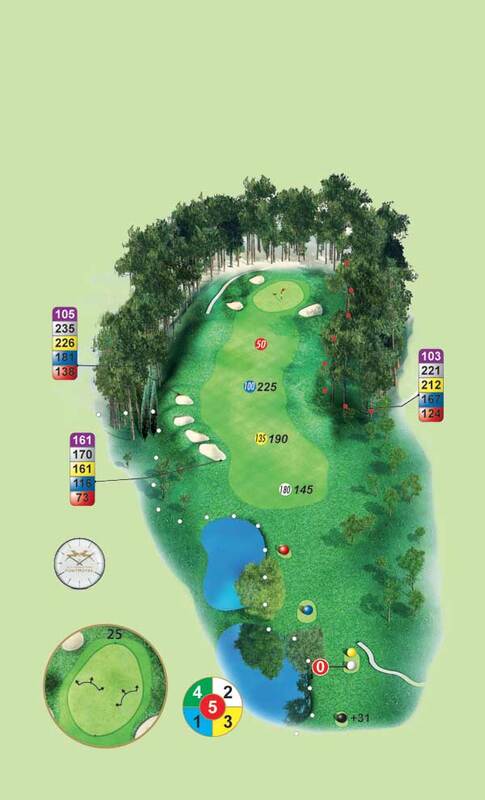 A long drive with a draw will miss the bunker on the right of the fairway and gives a good opening to the green. 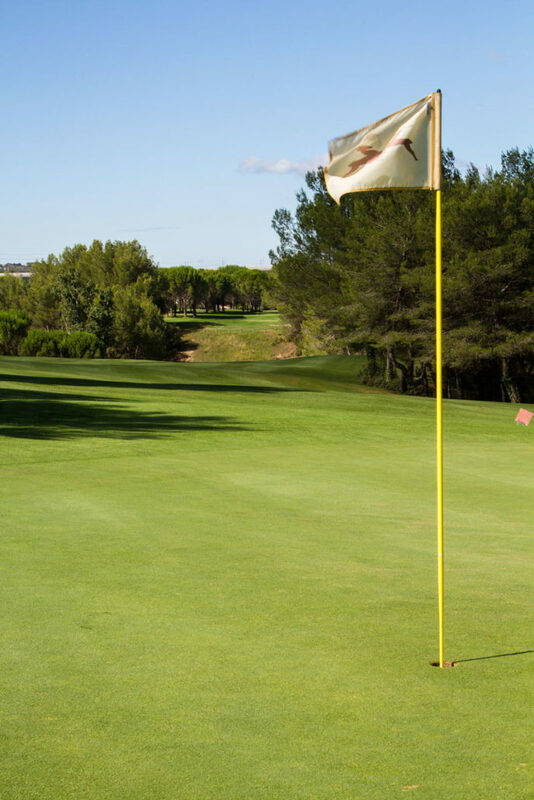 For the second shot it will be important to gauge the distance because the green has two tiers and is very fast and therefore difficult to judge a long putt. 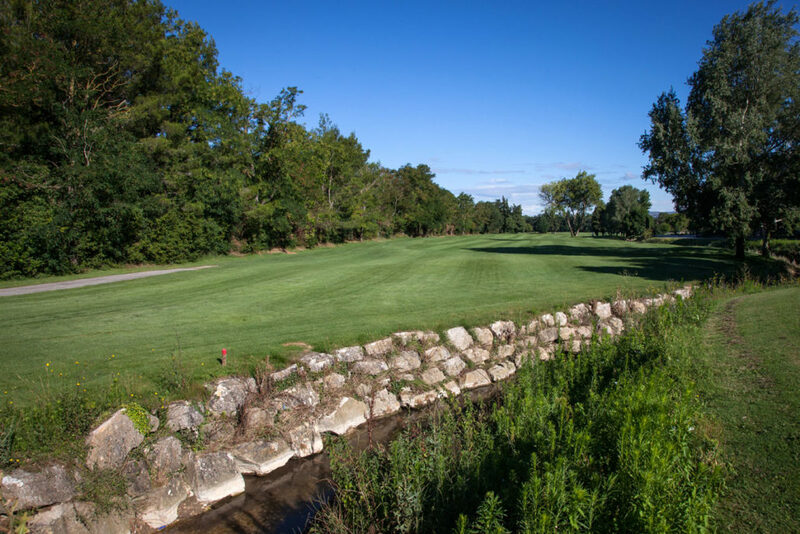 The fairway for this classic par 5 is flat and large, but be careful because down the left of the entire hole it is out of bounds and down the right all the way to the green is a stream. 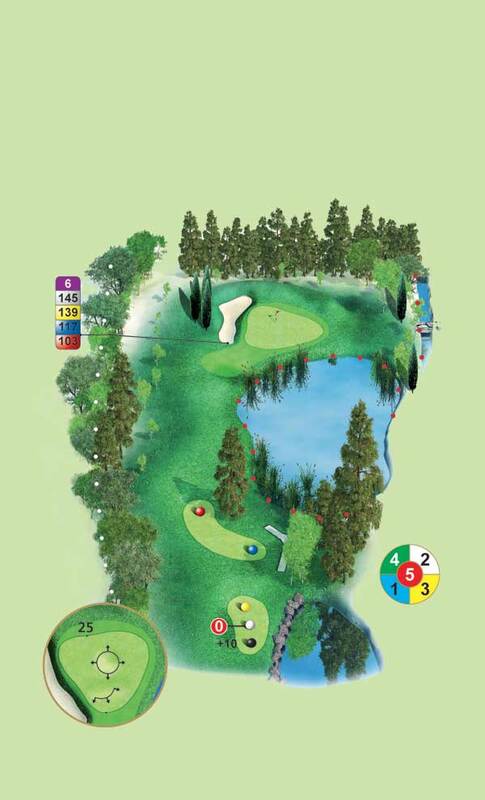 The second shot must be accurate because around the green there is a lake, a large bunker and cypress trees. 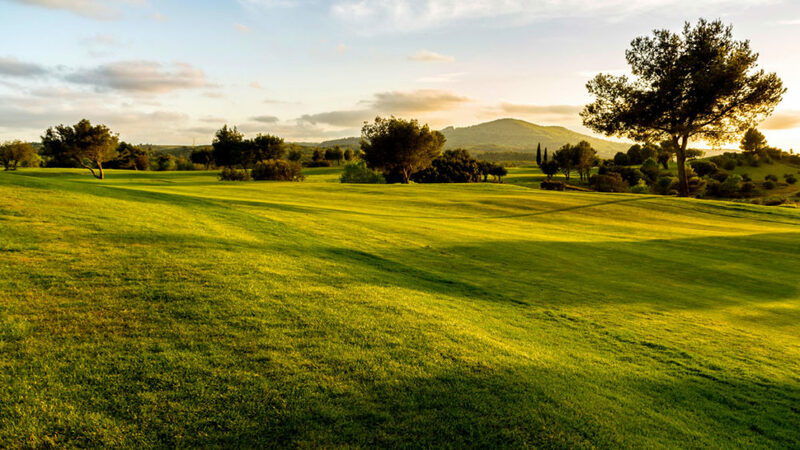 When the Mistral is blowing be very prudent because the slightest error on this hole becomes expensive. 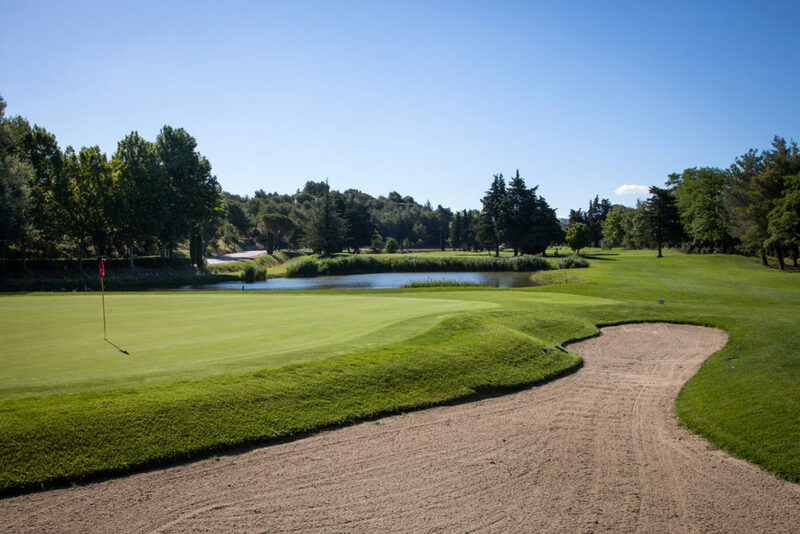 From the Tee Box of this par 3 it is necessary to align your shot a few metres to the right of the bunker to avoid a longer shot over the water guarding the green. 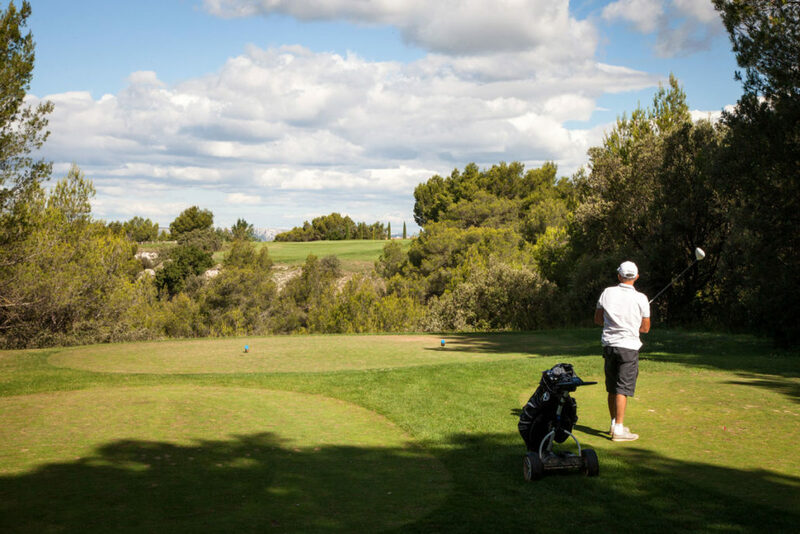 Do not hesitate to take a a club more than the distance suggest to you. 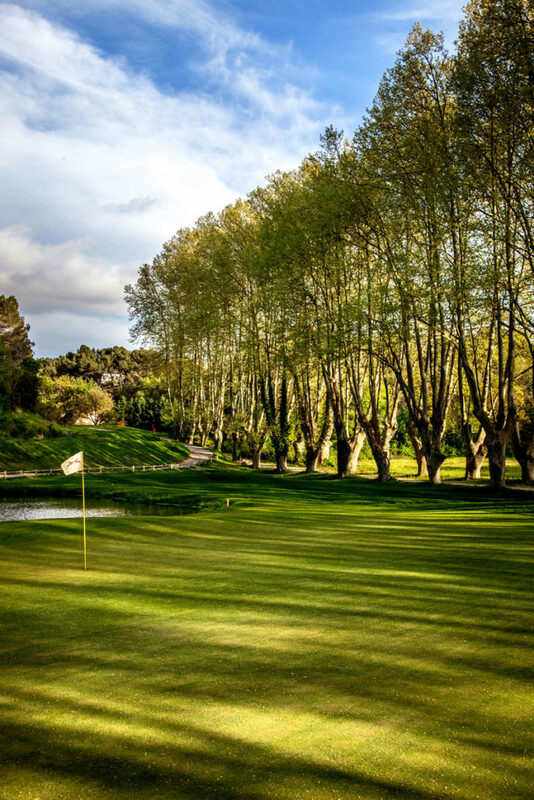 The back of the green is very welcoming and the putt, even if its long, will stay true. 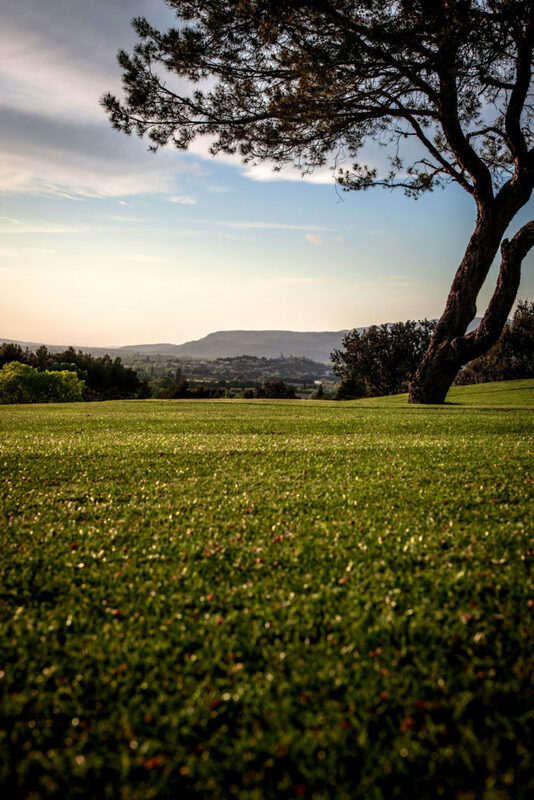 This par 4 climbs gently towards the green, partially hidden on top of the hill. 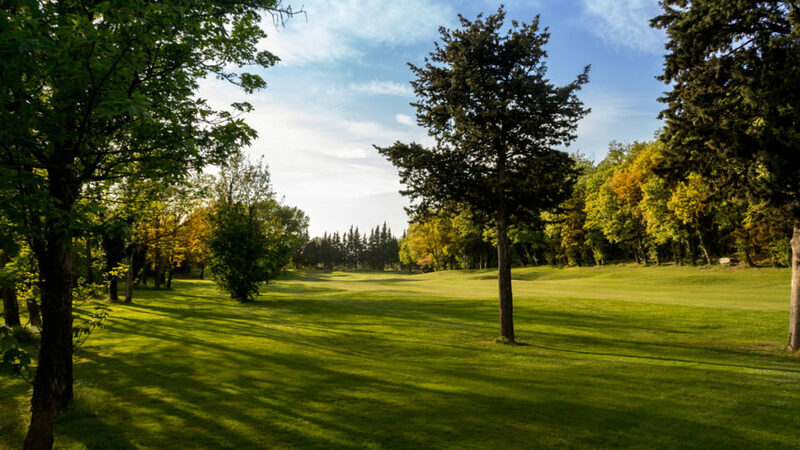 So a small wood or a long iron allows you to place the ball in the centre of a fairway bordered left and right by out of bounds and with a large bunker placed to trap a long drive. 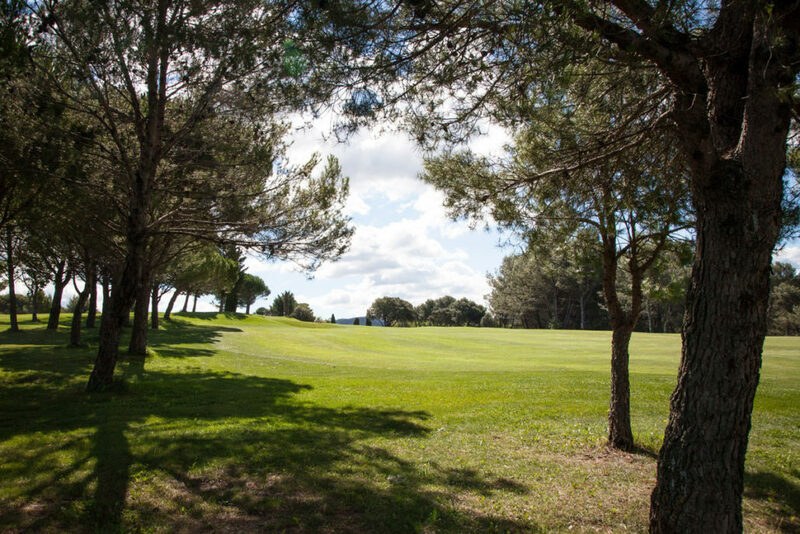 The short distance which remains for you reach the green will be difficult to judge the second shot because the green is partially hidden. 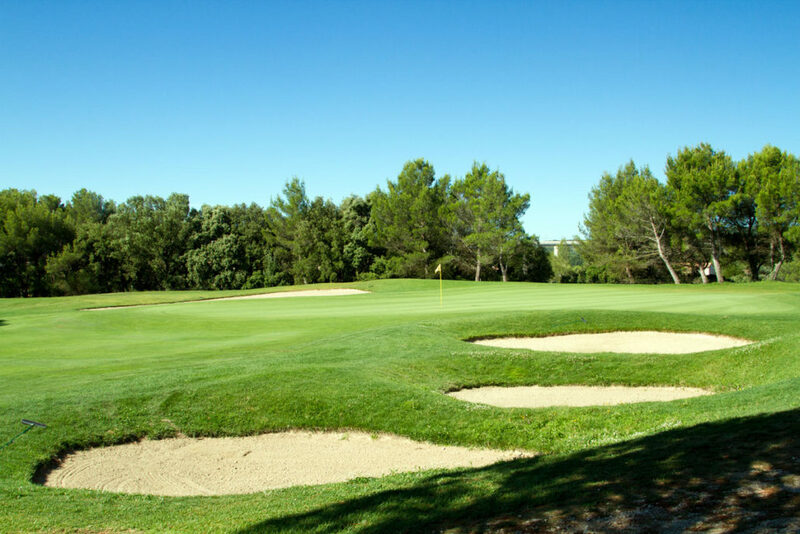 Beware also the bunkers on the left of the entrance to the green. 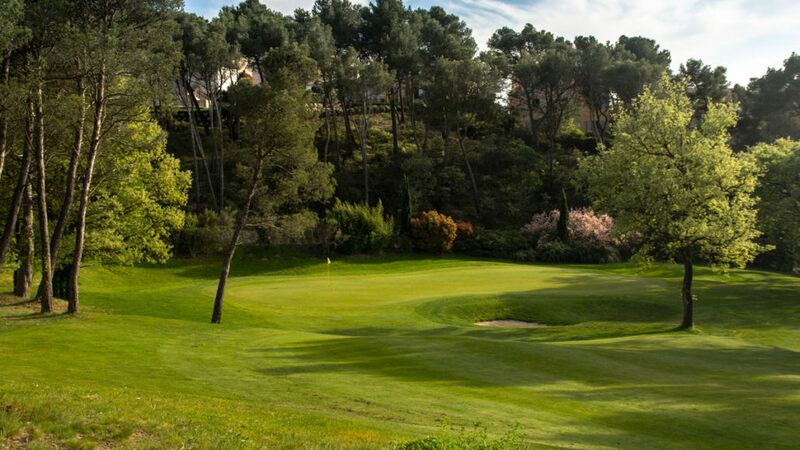 This par 4 hole with NO 11 are the signature holes of Pont Royal. 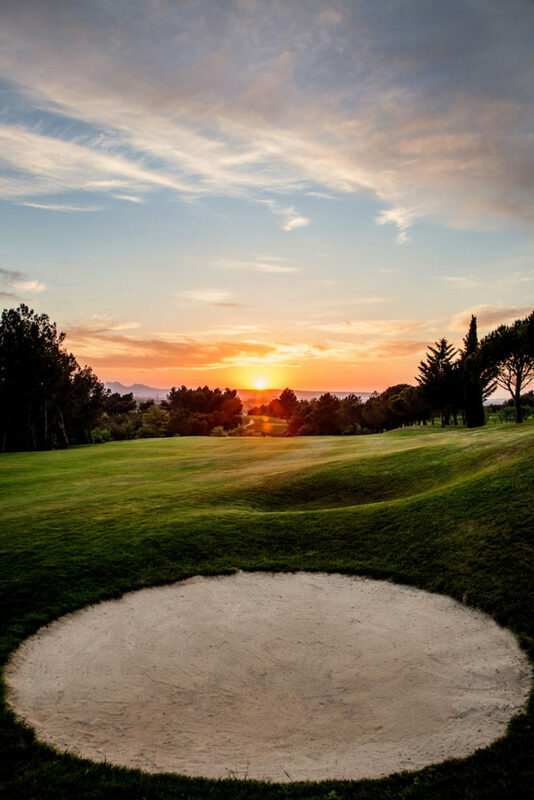 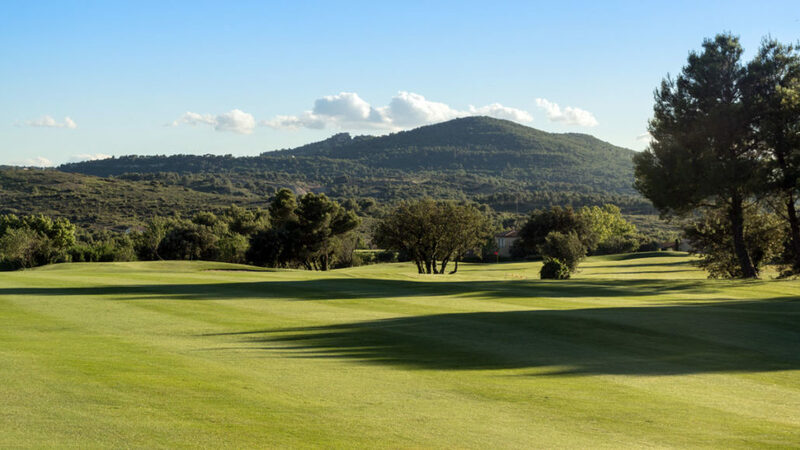 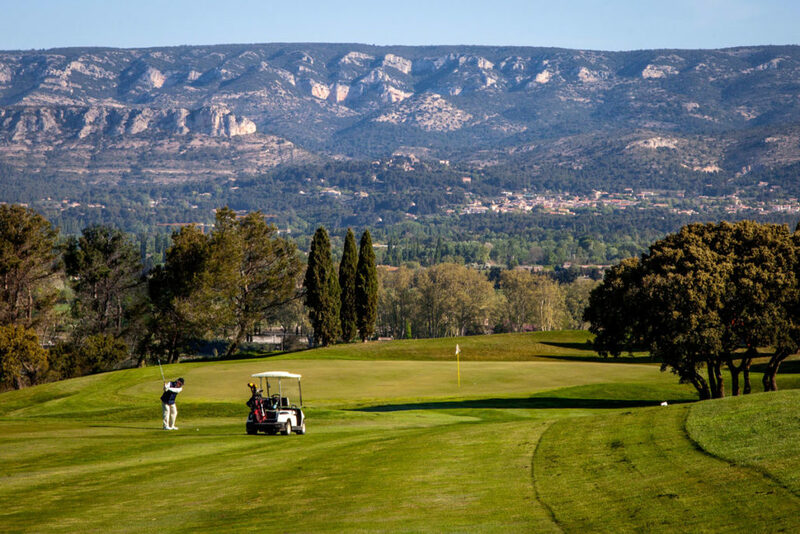 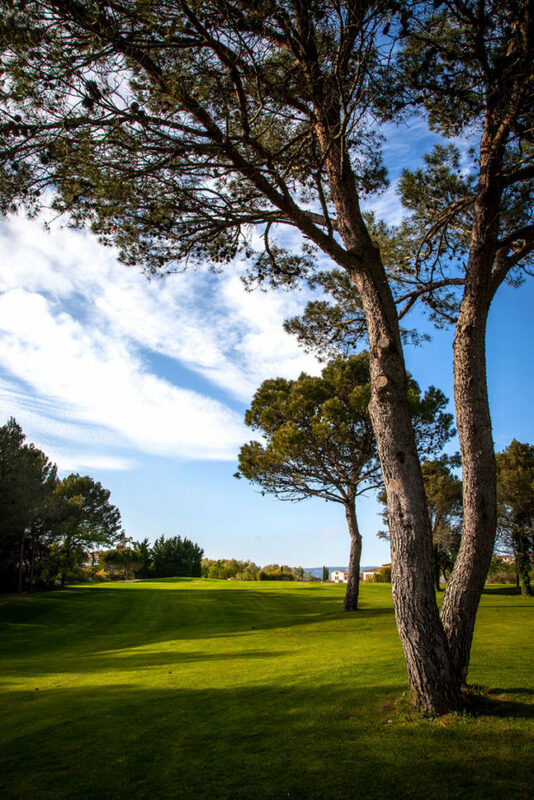 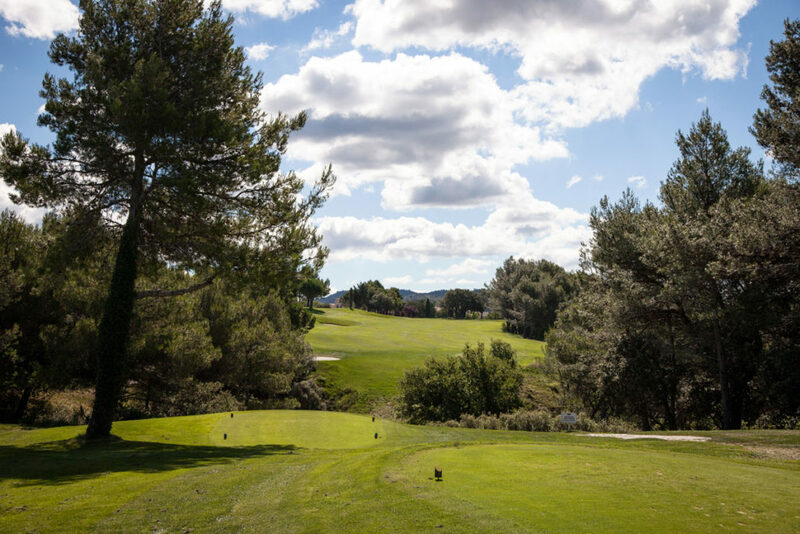 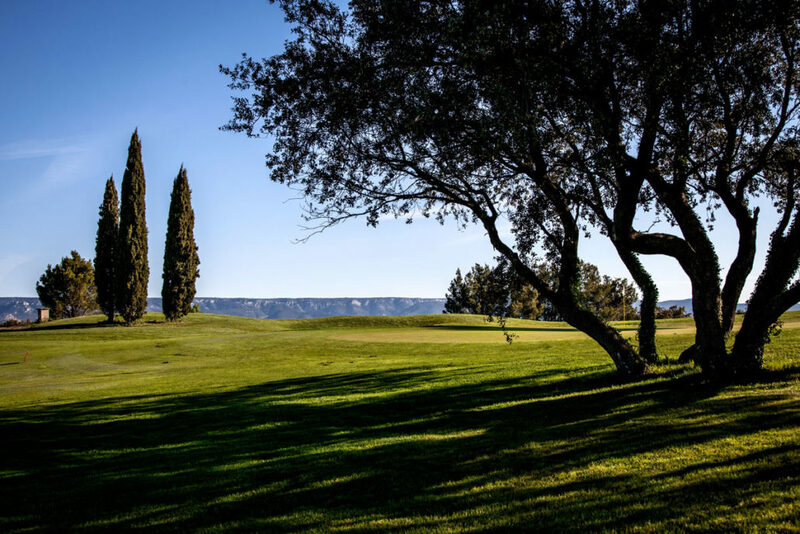 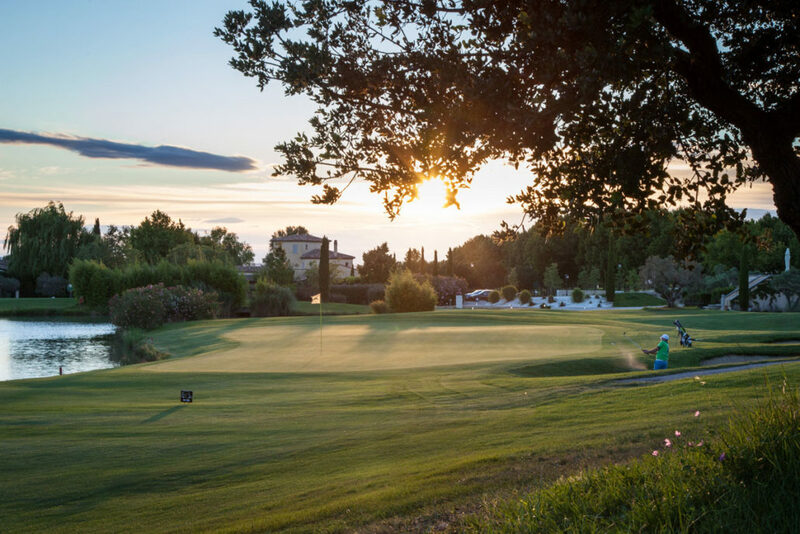 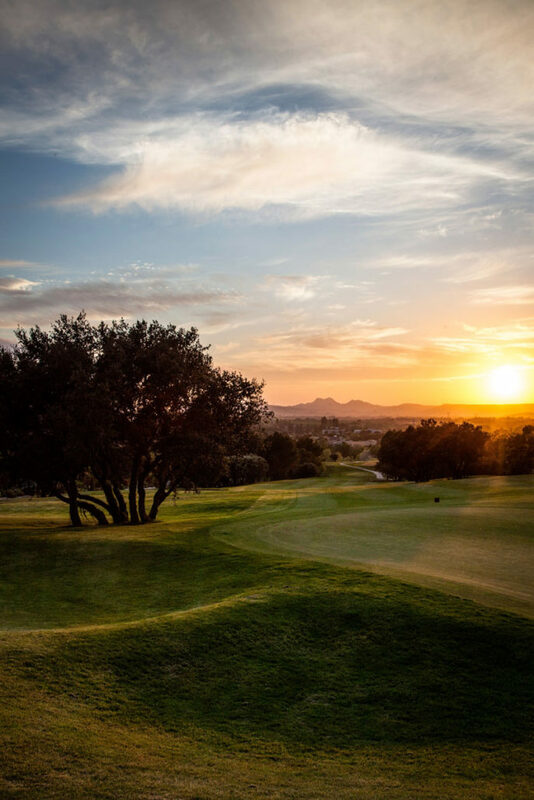 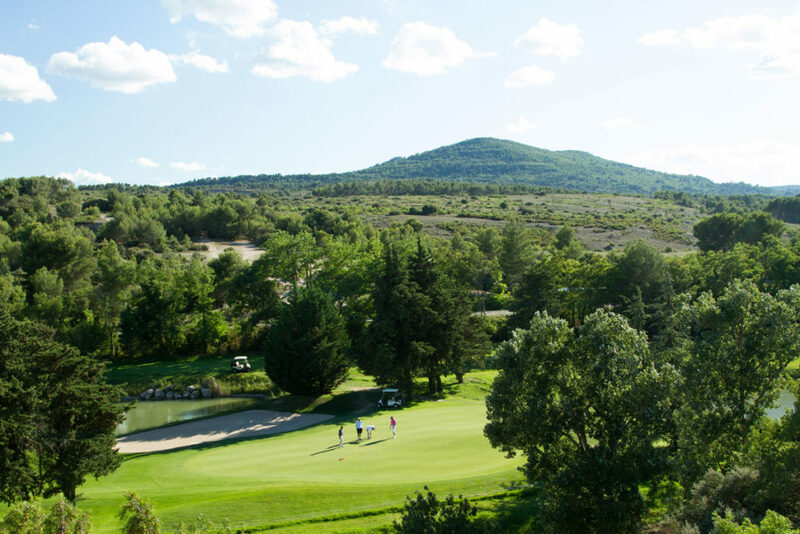 From the back tees you have a magnificent view of the Provence countryside. 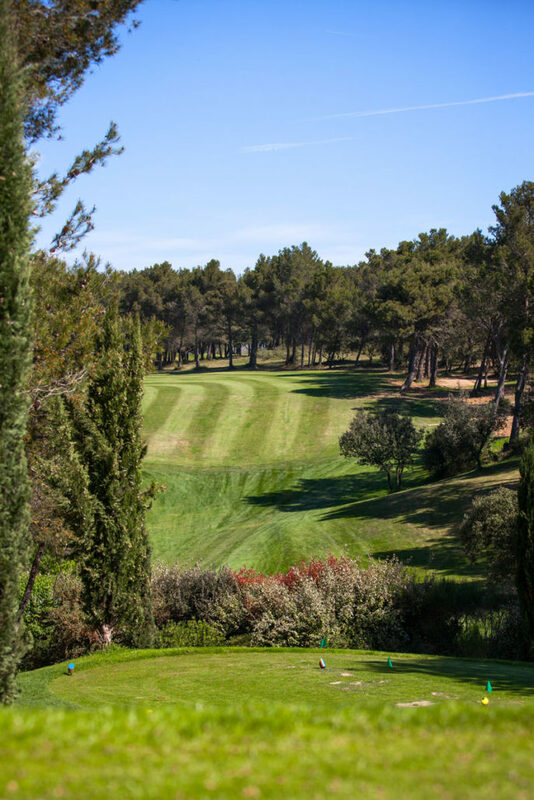 The fairway includes a dog left turning at right angles but the big hitters are able to cross the ravine and cut the corner even with the Mistral blowing. 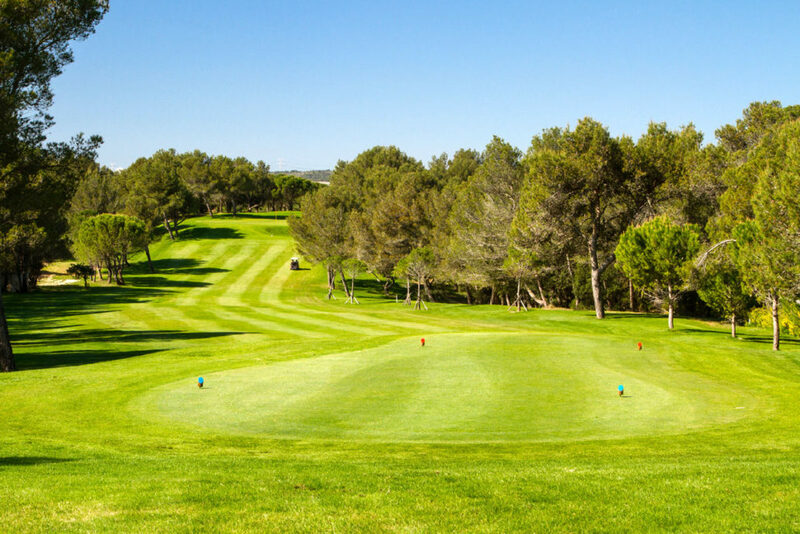 Otherwise prudence dictates a drive played to the middle of the fairway leaving a second shot both long and difficult. 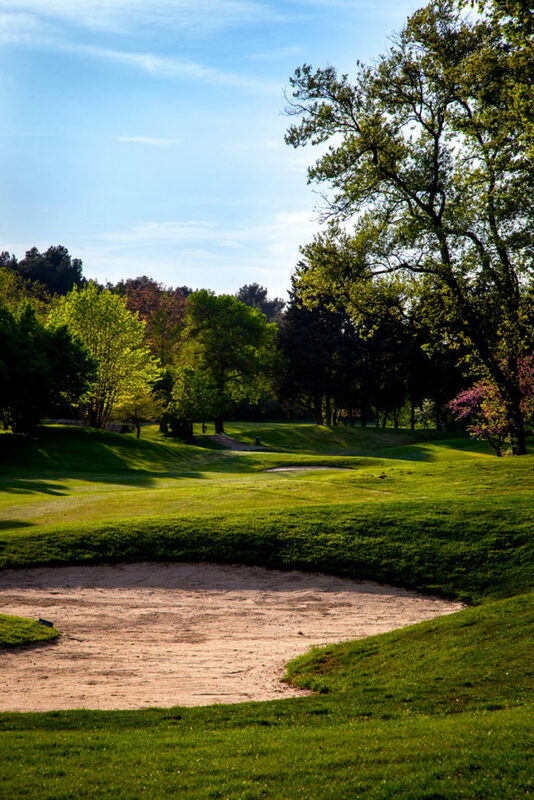 The green has a double level, which slopes gently to the back and is protected by bunkers on either side. 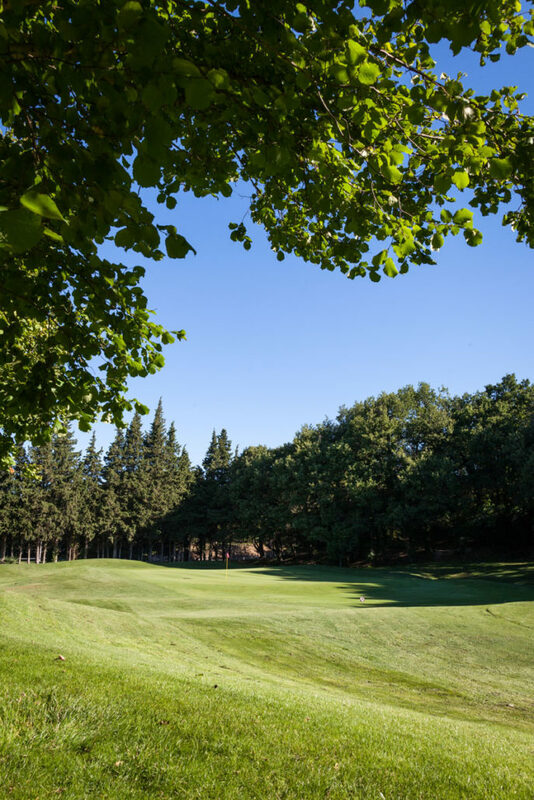 From the Tee Box of this long par 4, with a dog leg to the right it is important to align the drive on the edge of the trees running alongside the fairway on the right. 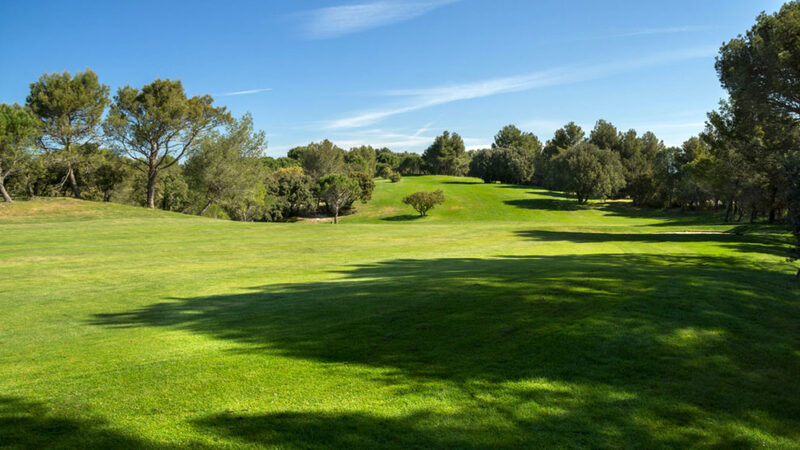 You avoid then the risk of sending your ball out of bounds into the properties situated on the left and those facing you. 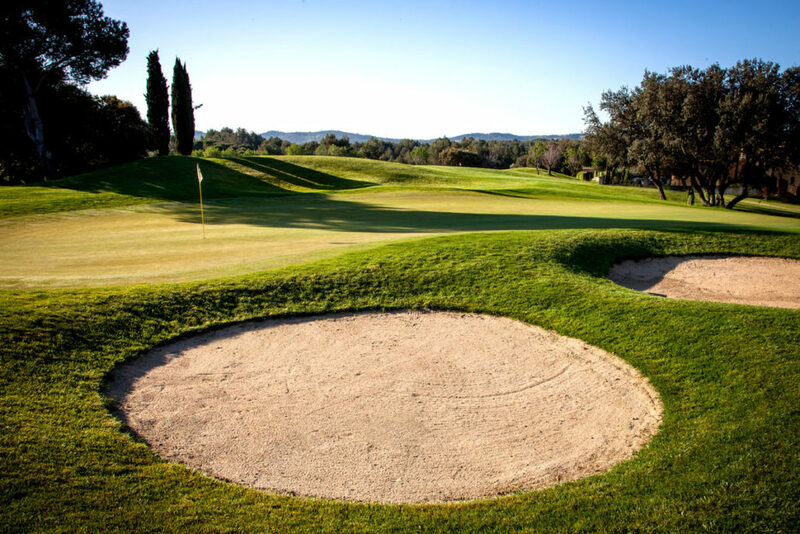 With the second shot you must attack the green from the right to avoid the large bunkers which make access difficult from the left. 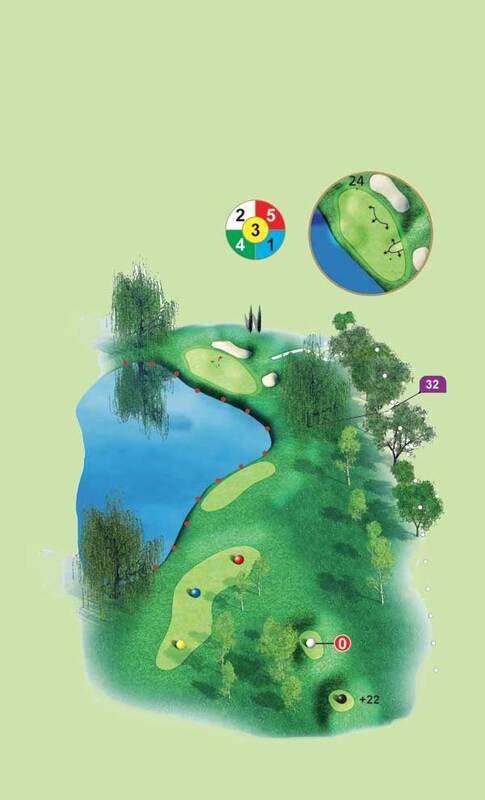 The direction of the slope will take your ball from right to left towards the flag. 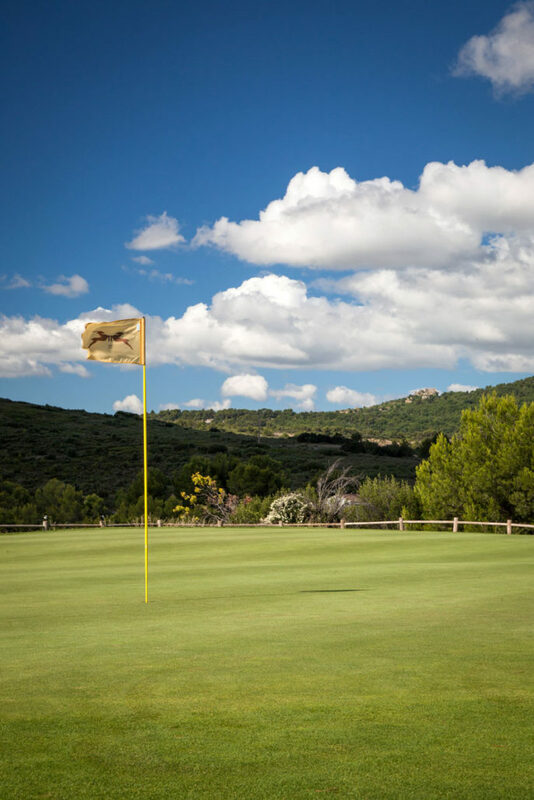 Putting is difficult because of the varied slopes and requires plenty of concentration. 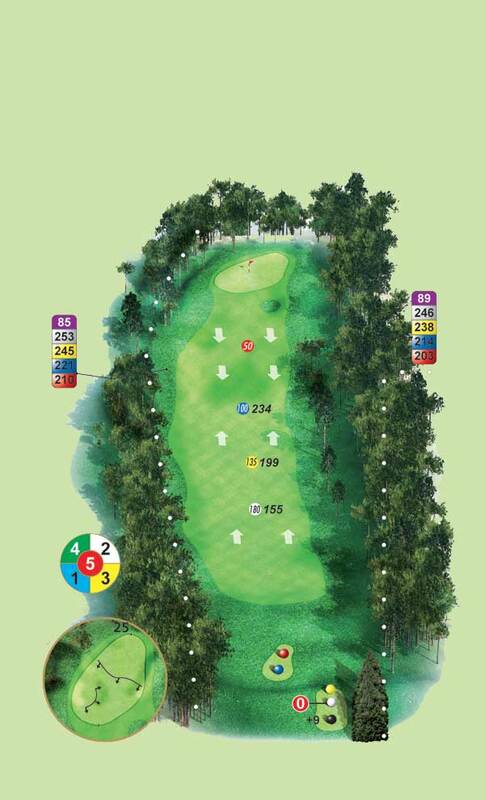 On this par 5 the big hitters are able to have a powerful drive without too many risks despite the out of bounds on the left. 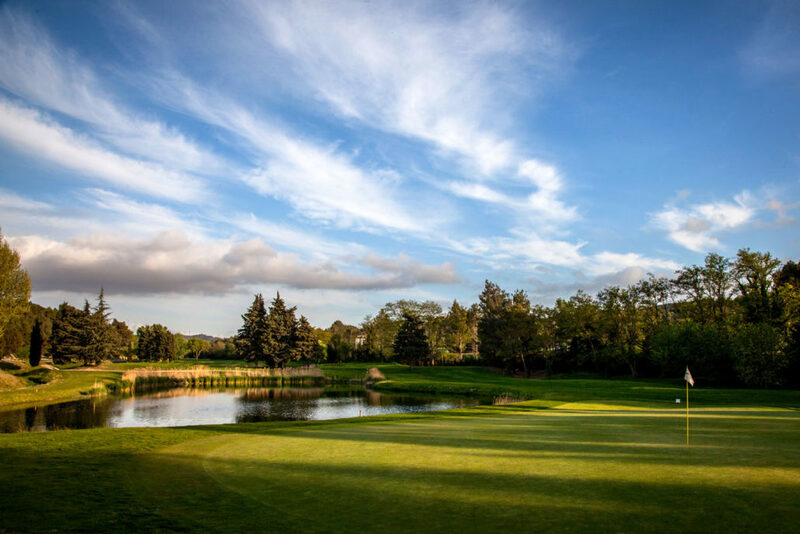 It is better to throttle back to play a medium iron with the second shot followed by a chip onto the green guarded by a lake and bunkers. 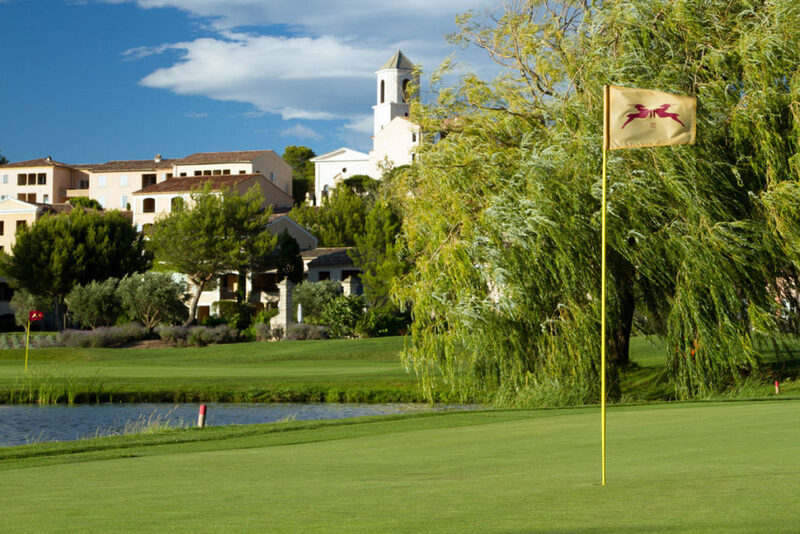 The chip requires precision but a birdie will then be there for the taking. 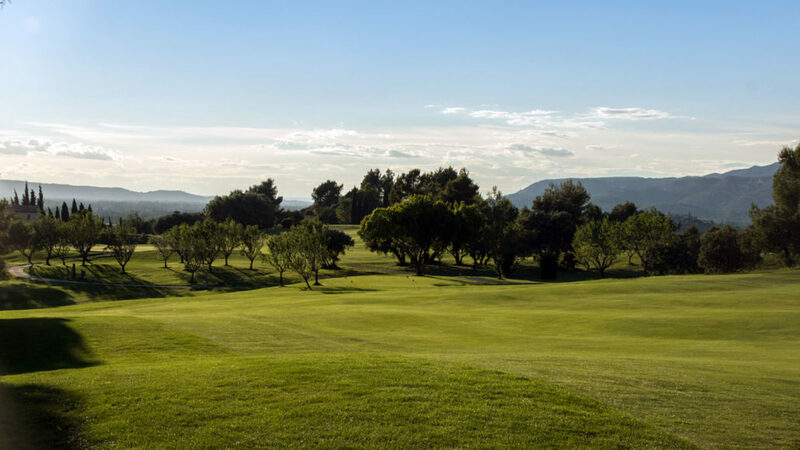 For a good score on this classic par 4, which includes a gentle right handed dog leg, it’s important to place the ball on the fairway. 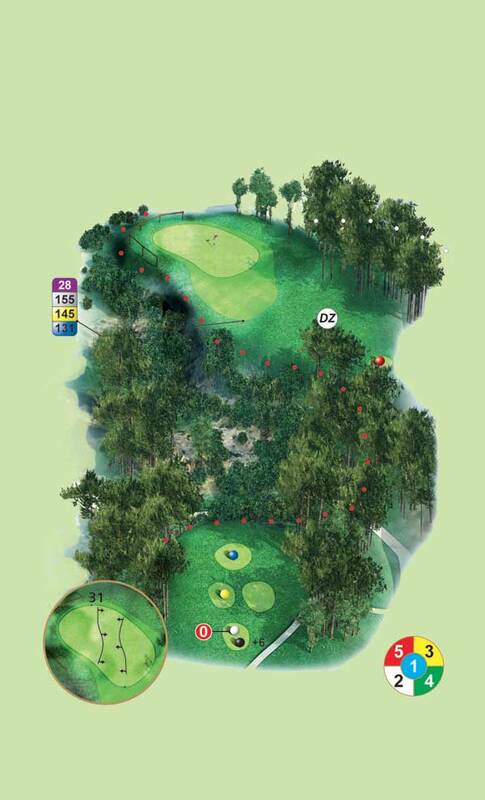 This avoids the large bunkers on the left and the trees on the right. 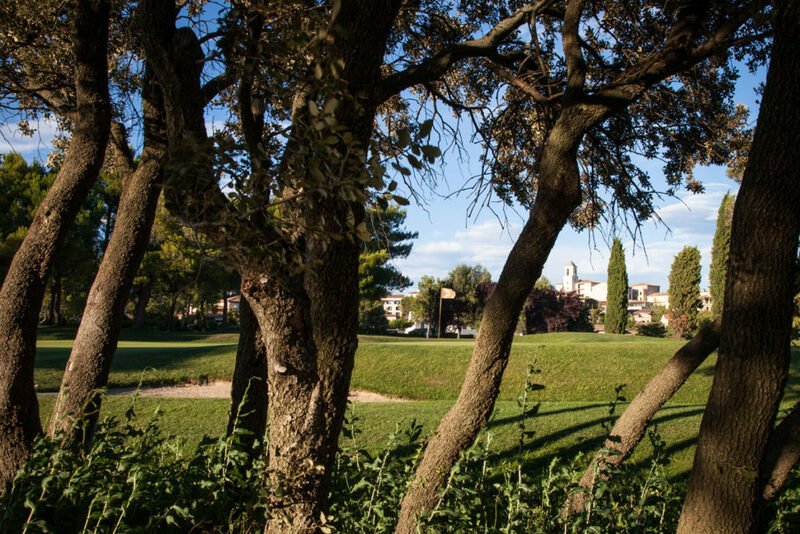 The choice of club for the second shot remains the major difficulty. 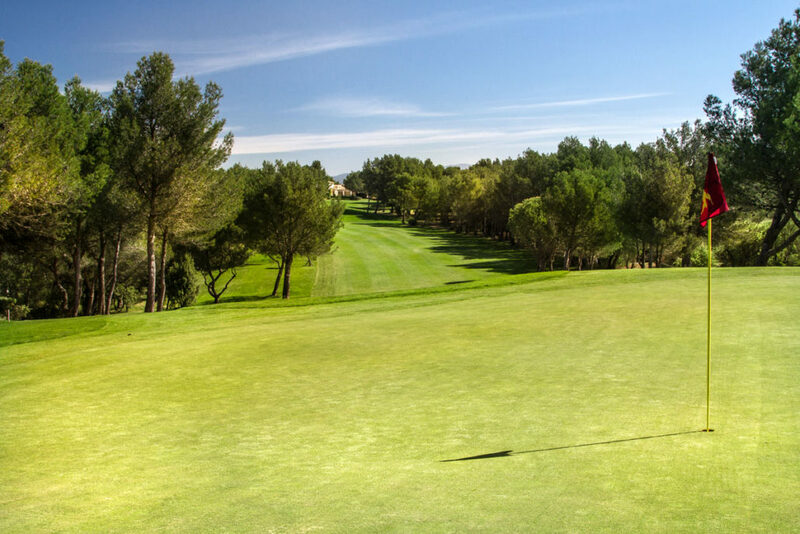 Better to be certain of playing almost short of the green because the ball will roll fast towards the back. 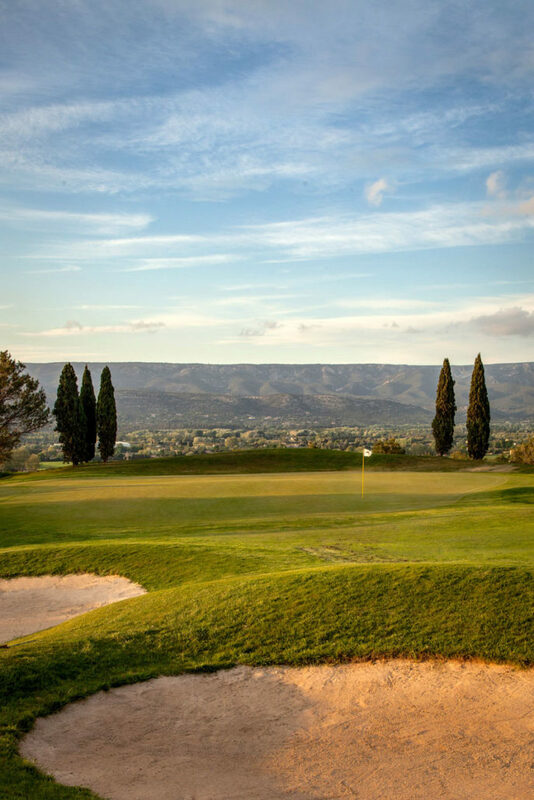 This impressive par 3 hole with a ravine to cross and the Alpillles in the background will stay etched in the memory of the golfer. 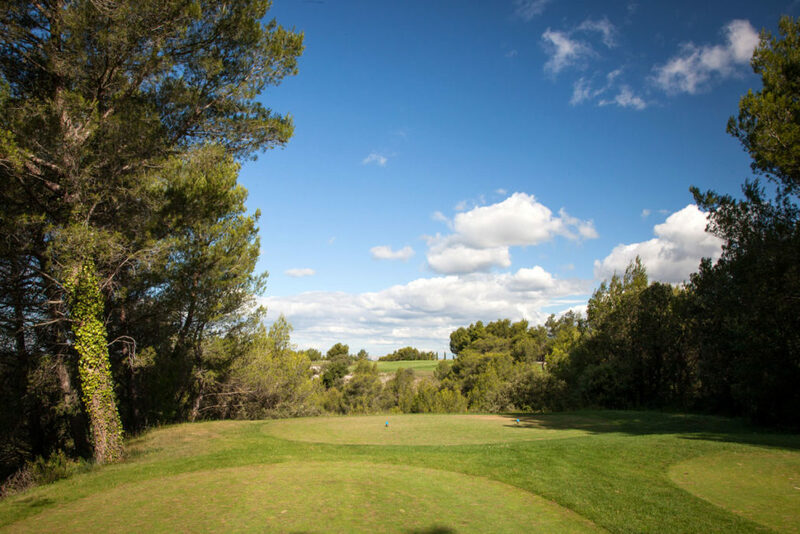 Leave aside everything on the left of the green, the cliff, the ravine and the distance to fly over and concentrate instead on aligning your shot to the right where your ball will find a corner of the fairway if you miss the green. 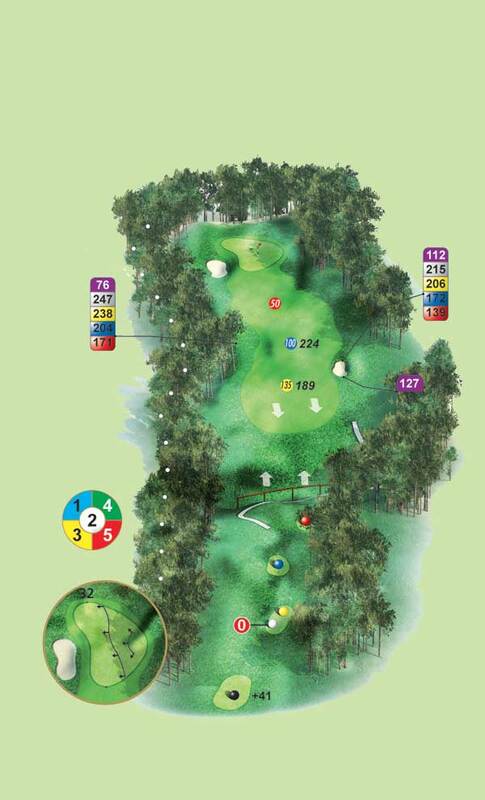 If not a dropping zone awaits you on the other side of the ravine near to the red tee. 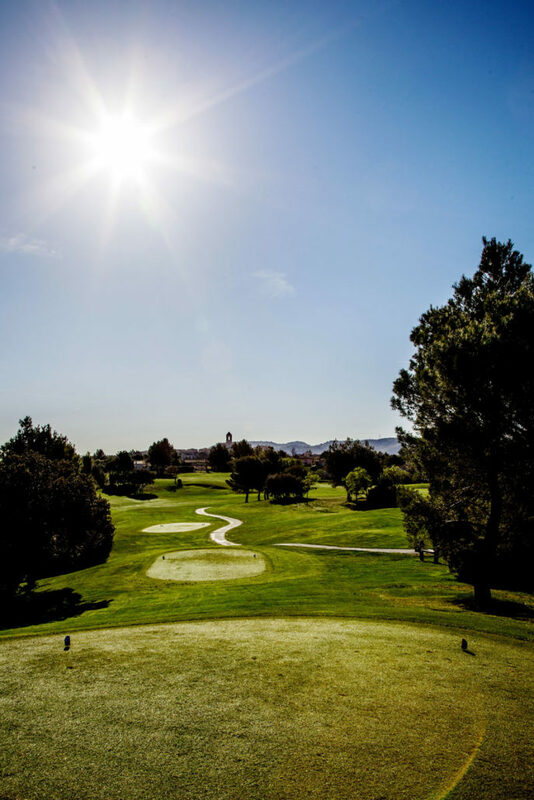 Depending on the force and direction of the wind the choice of club from the tee box can vary from a 7 iron to a driver! 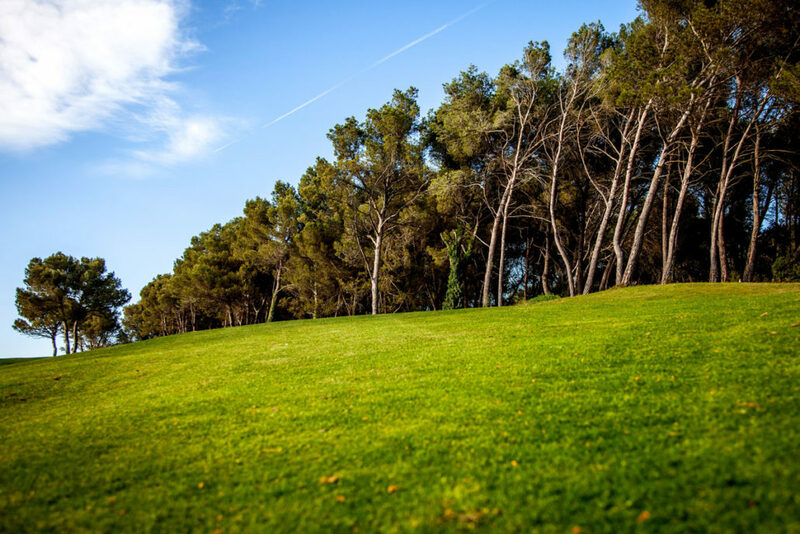 Rest assured the green is large and welcoming. 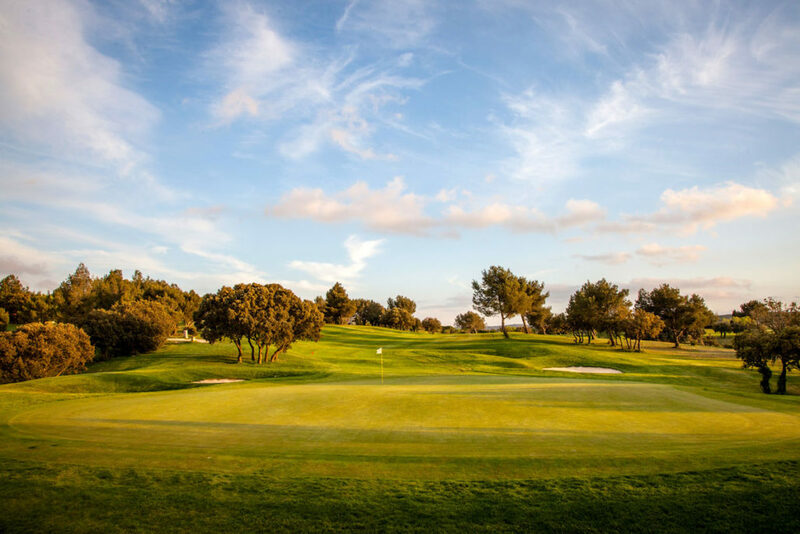 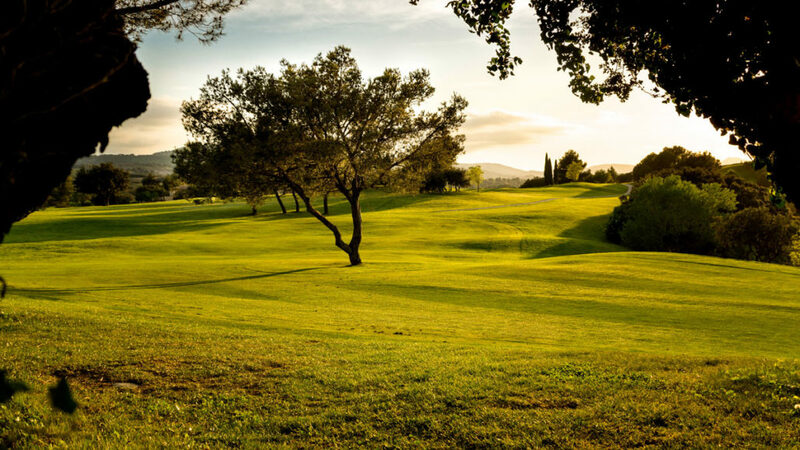 On this attractive par 4 which climbs gently towards the green, a good drive allows you to clear easily the obstacle which separates you from the fairway. 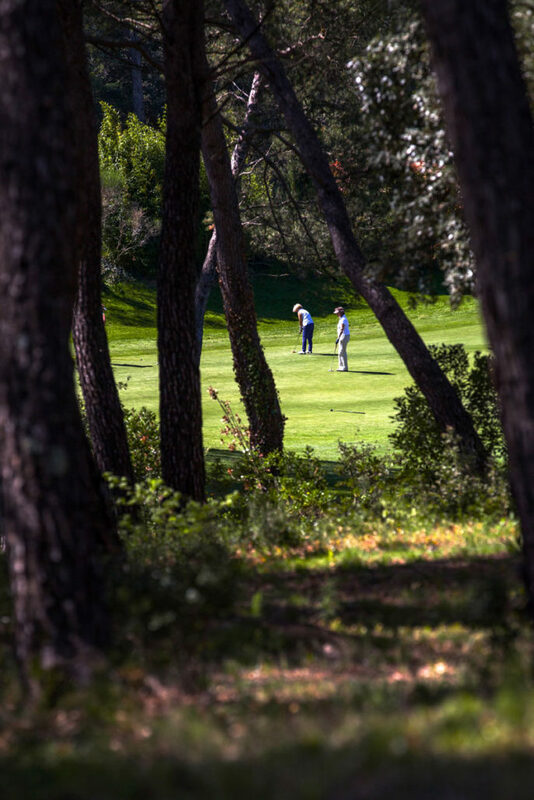 It is best to aim your shot more to the left because the main dangers lying in wait are in the wood on the right. 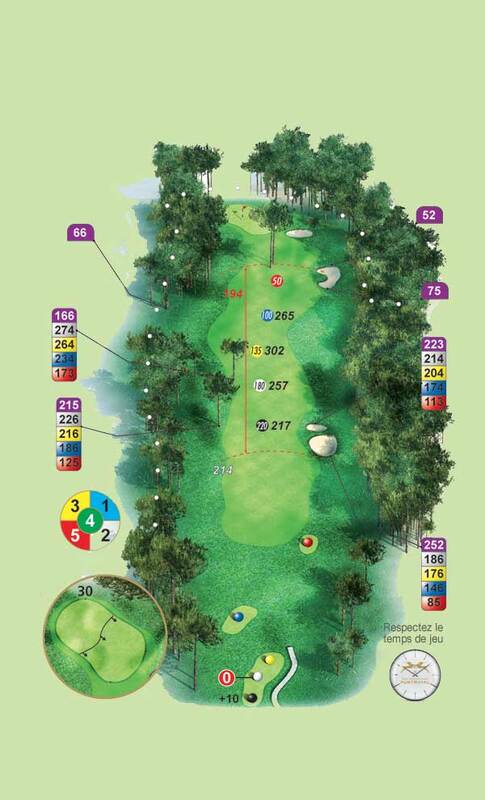 The second shot has to pass by or fly over the clump of oaks, in the middle of the fairway, forgotten by S. Ballesteros. 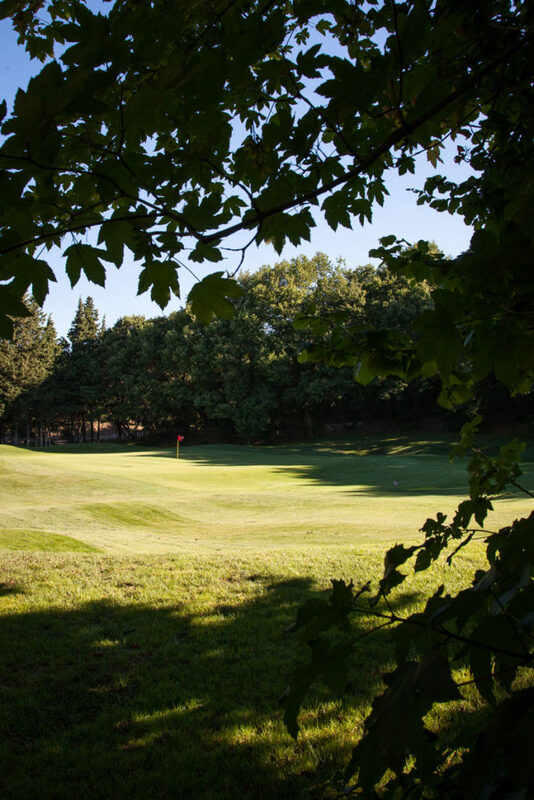 The green is well protected on both sides by bunkers. 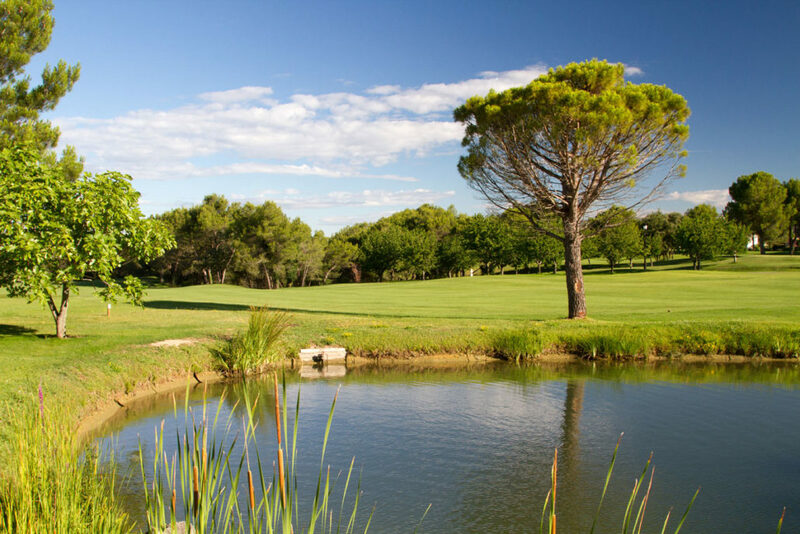 On this short par 3 especially with the Mistral blowing, it is vital to choose the right club to land on the narrow green defended by a lake in front and bunkers all round. 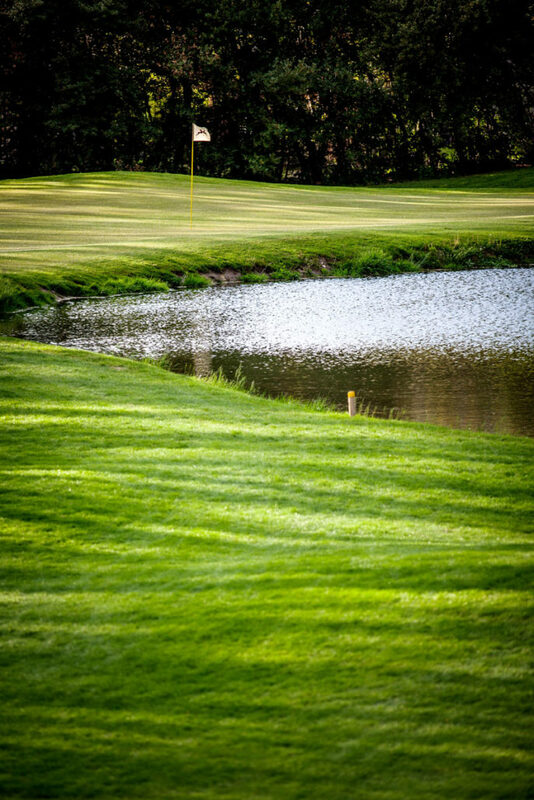 The slightest error of judgement, on this hole condemns you to signing for a bogey in the best case. 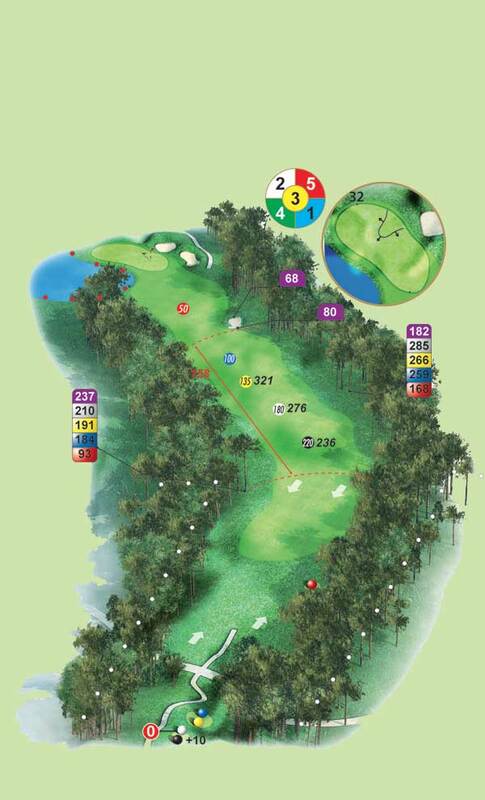 This par 5 is very narrow and technical perhaps reachable in two shots by the big hitters who like to take risks. 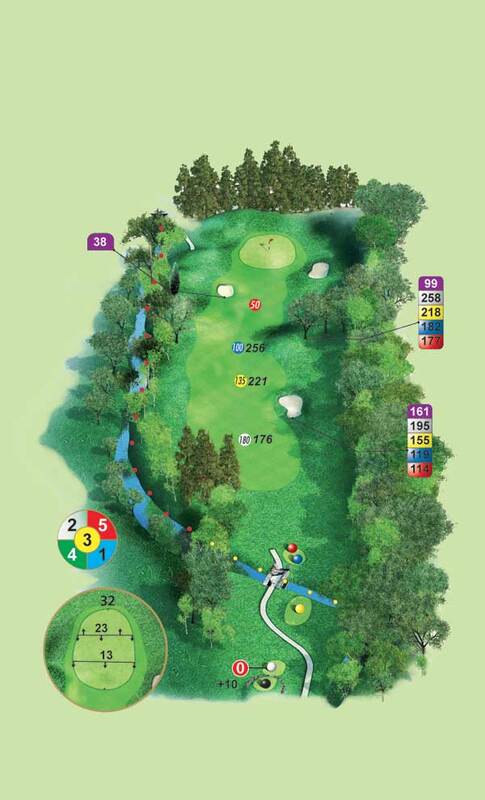 The practice area on the left is out of bounds and the bunkers on the right are placed to catch the drive. 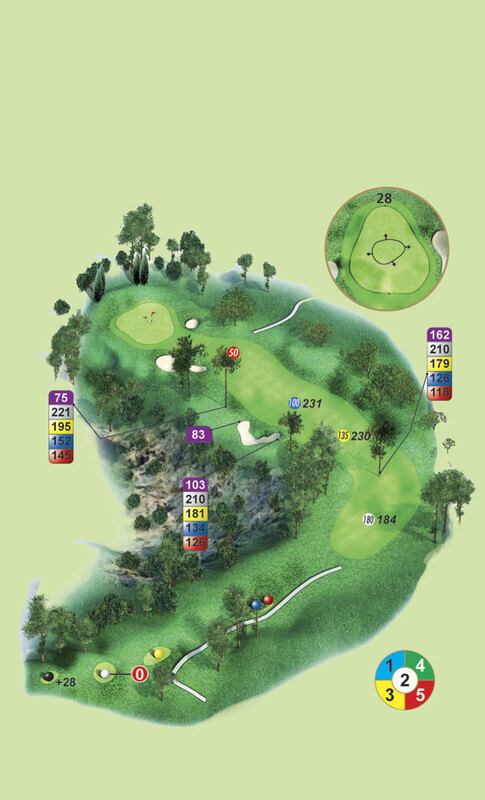 Attacking the green, which is well defended by a bunker, numerous trees, with out of bounds on all sides, is very tricky. 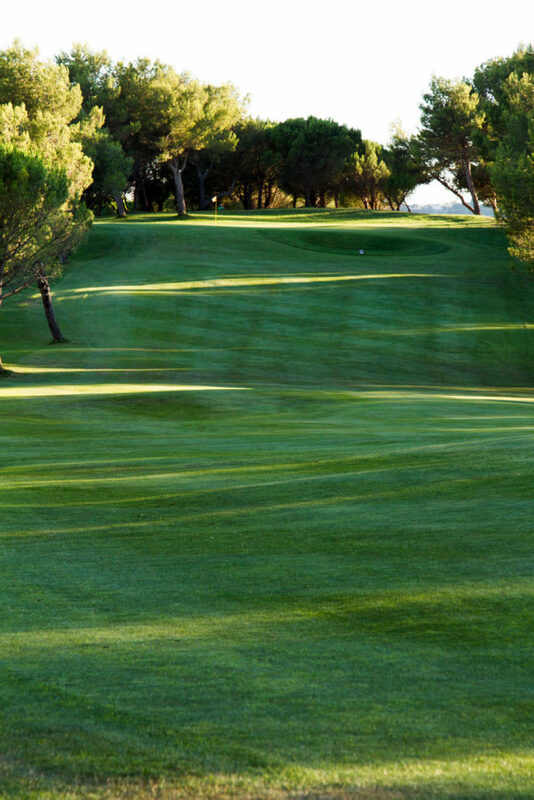 It is best to place your second shot in the middle of the fairway leaving a medium iron to focus on your approach. 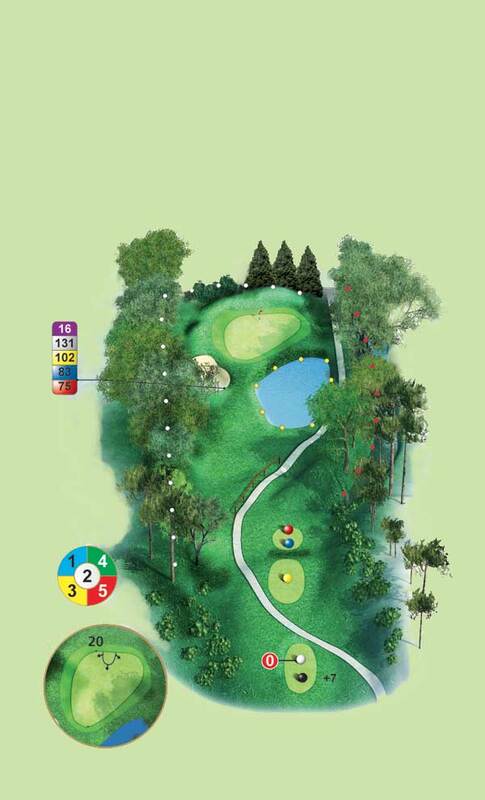 The par will be easy but the birdie difficult. 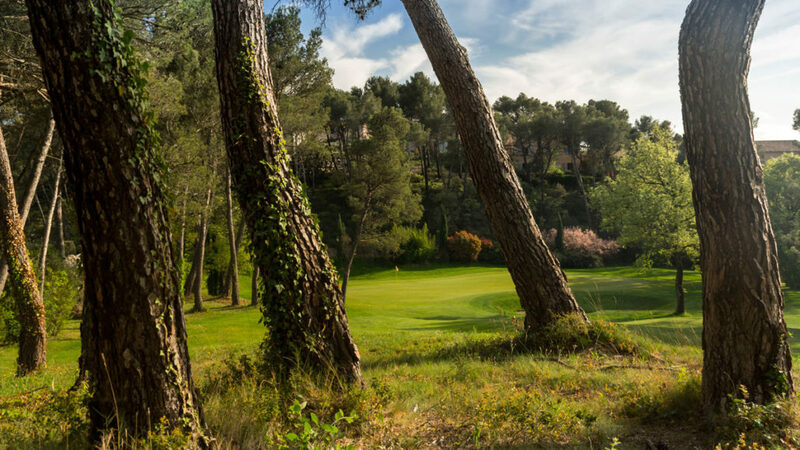 A magnificent hole but very narrow, cut into a forest of pines. 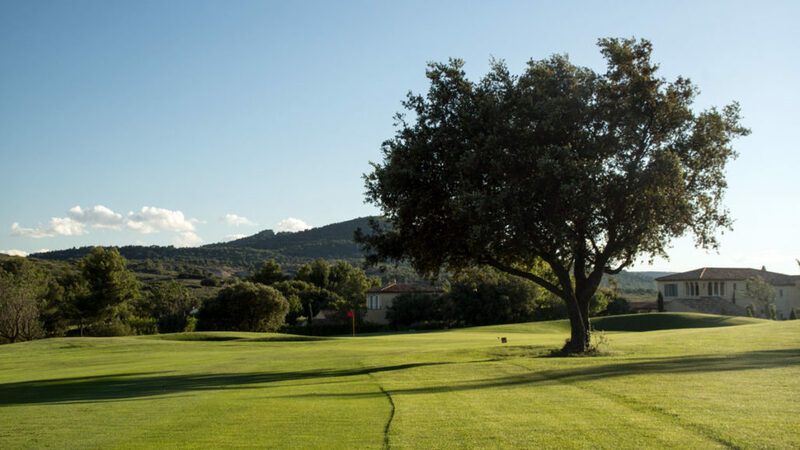 Do not take any risk and ensure that your tee shot lands on the left of the fairway to ensure you have a good opening towards the green. 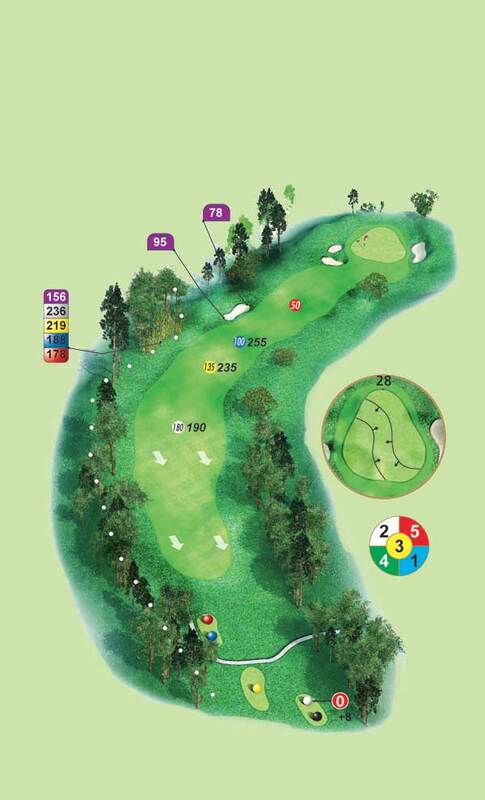 The second shot is short enough but the distance will be difficult to judge with the green placed on top of a hill. 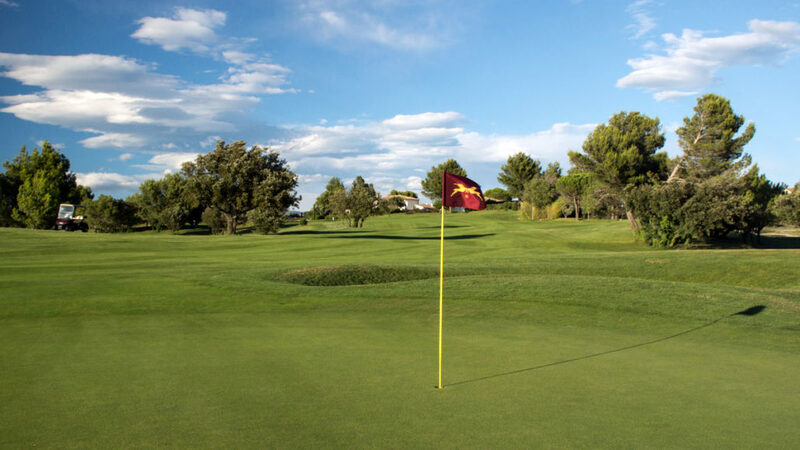 A warning, do not leave your approach shot short or you will go astray on the lower side of the green and the par will be compromised on this hole. 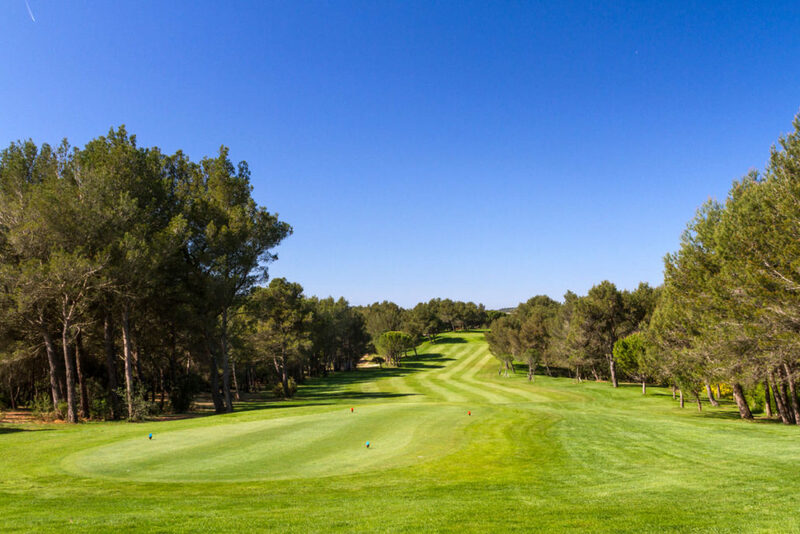 On this par 4 including a dog leg to the right drive to the centre of the fairway because on the left awaits a fairway bunker and worse out of bounds running the length of the hole on the edge of a wood. 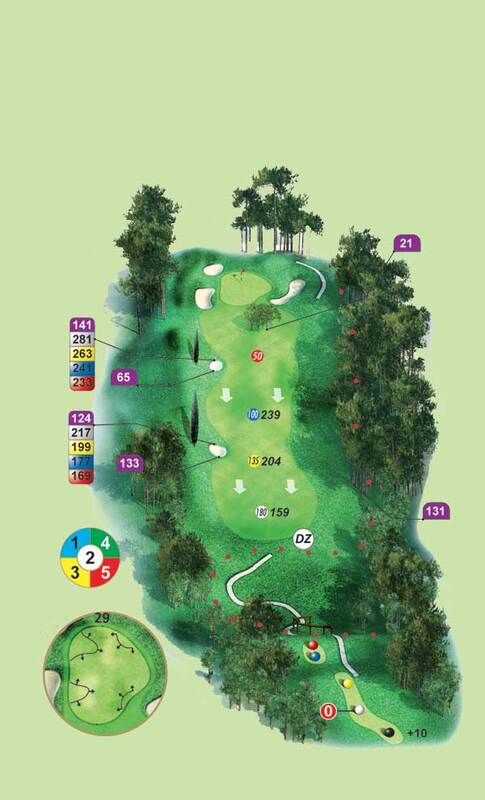 By comparison the second shot will seem quite easy in spite of a large bunker to the right of the entrance to the green. 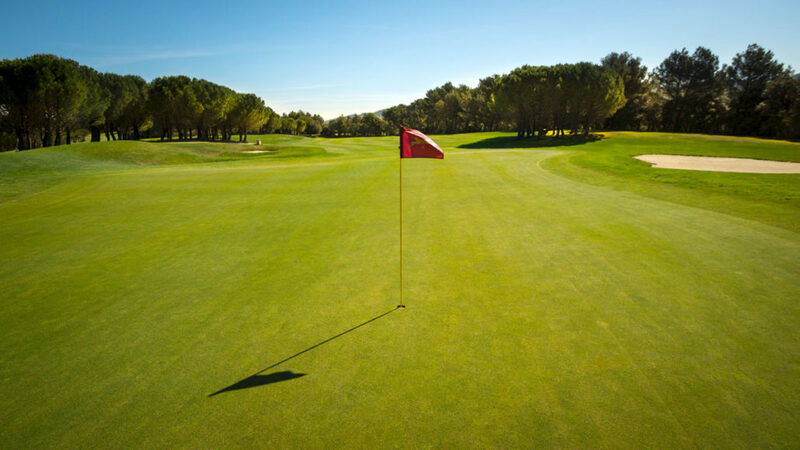 Be careful with the distance, golfers often leave the ball short of the green. 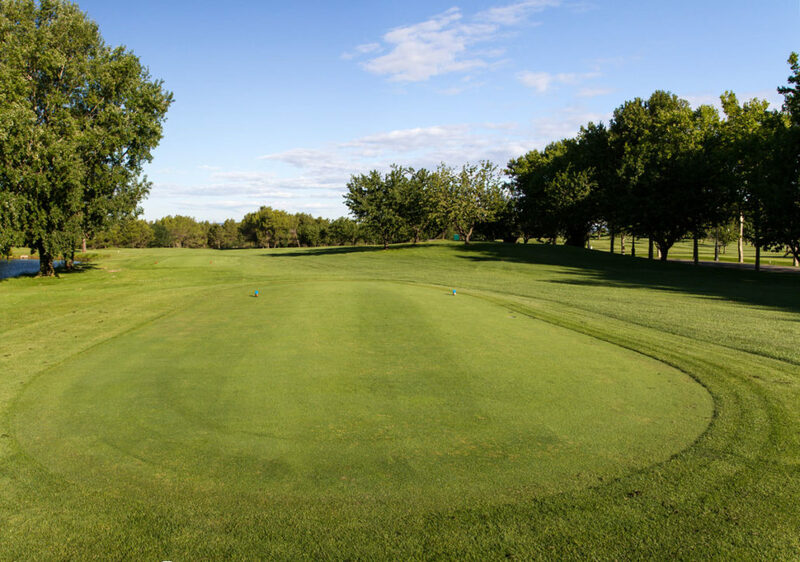 A long drive placed on the left of the fairway is ideal for the second shot. 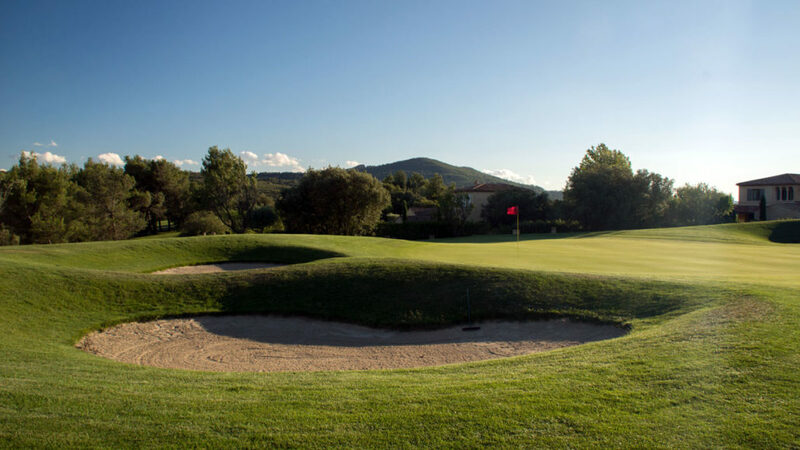 But beware of the large fairway bunker on the right. 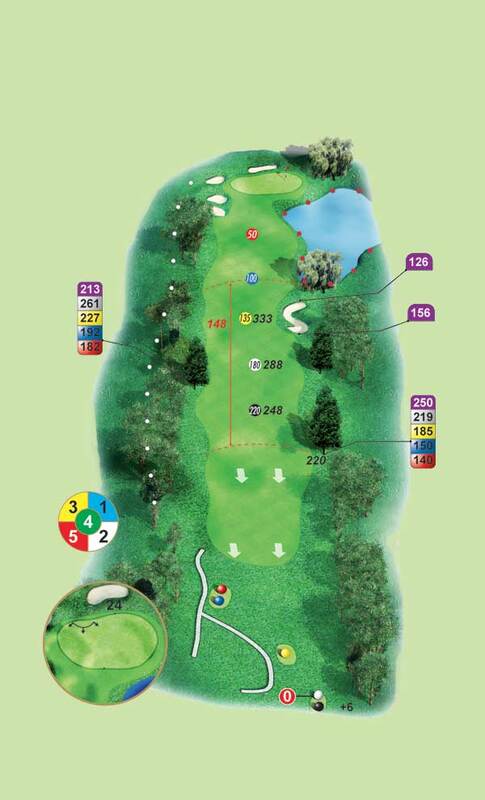 Entering here will leave you very little possibility of recovery on this very technical par 4. 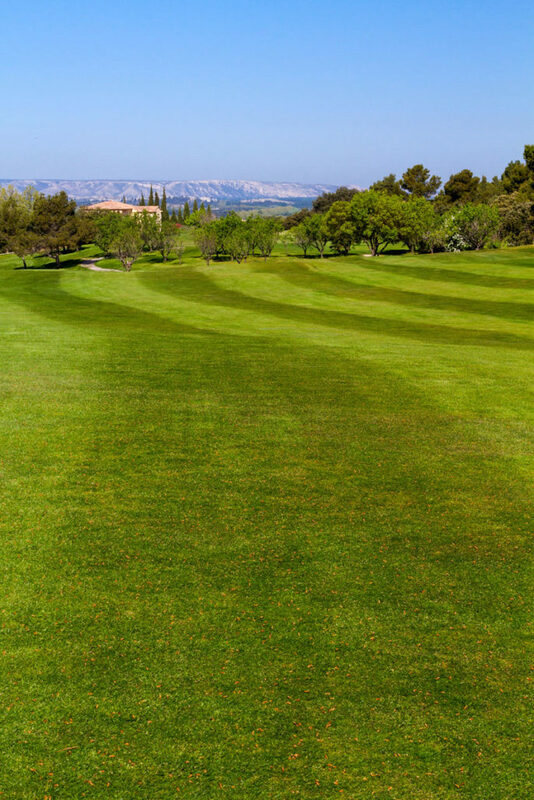 The green slopes excessively from right to left and requires an approach on the right and a high trajectory. 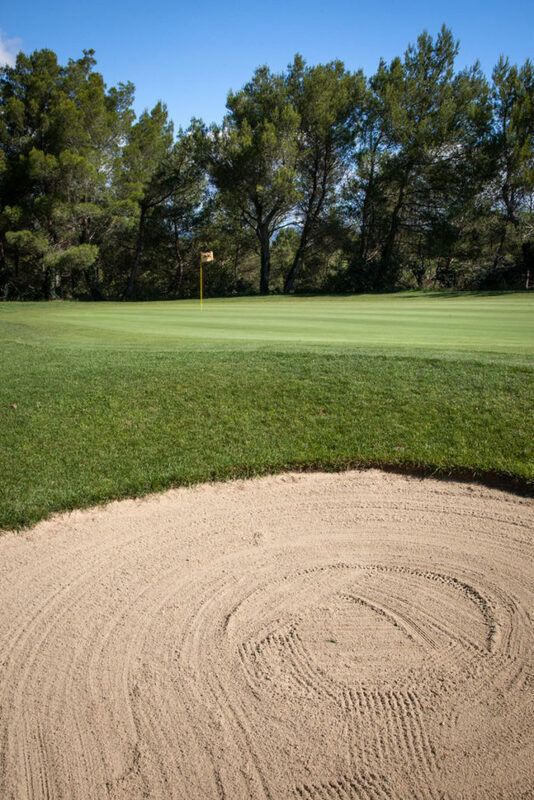 If not your ball will finish in the bunkers placed on the left of the green. 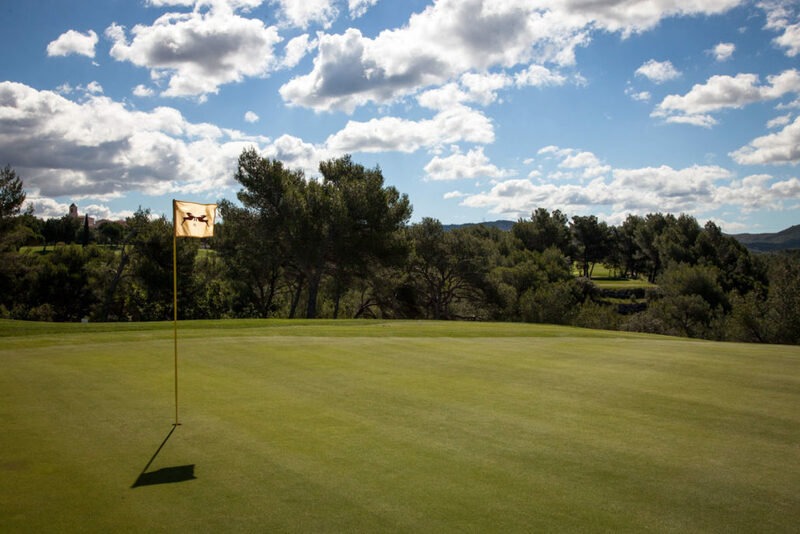 Concentrate on your putting because 3 putts, or more are very frequent on this most difficult green. 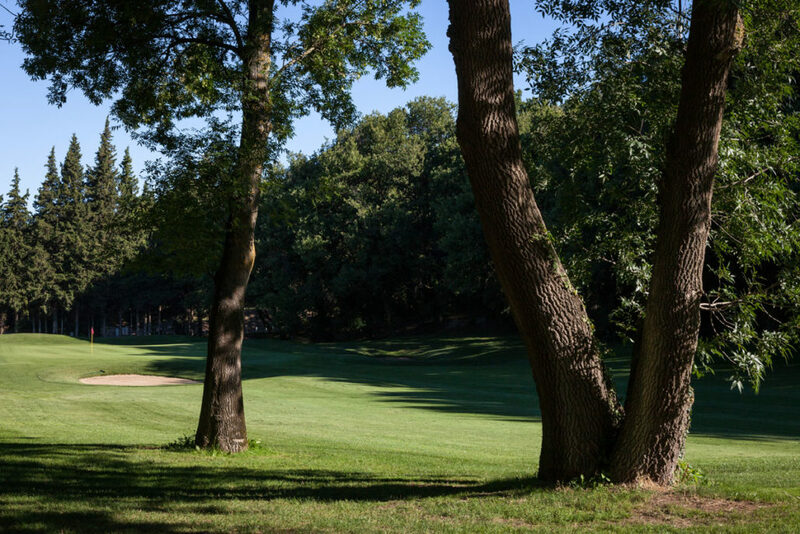 Above all do not try to cut this dog leg to the left because the sanction will be severe and only a chip out of the wood will be possible if you are fortunate to find your ball. 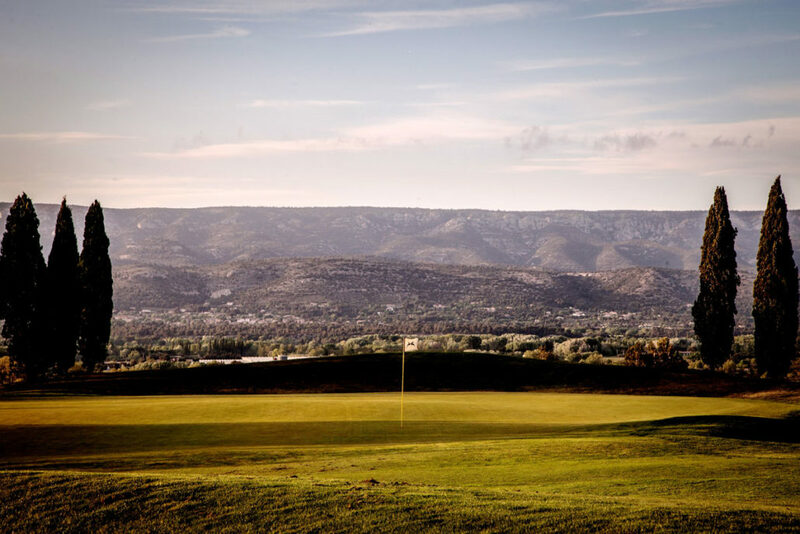 Rather place your ball on top of the plateau which faces you from the tee box. 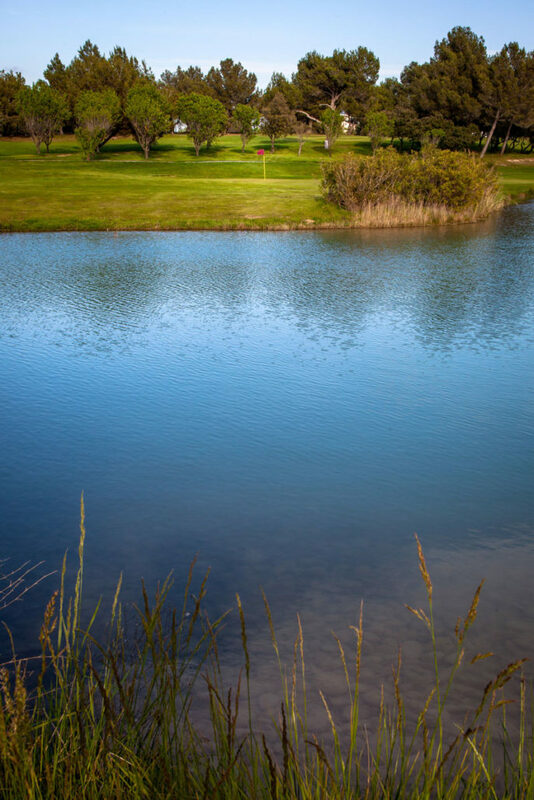 The second shot hit towards the Club House, needs only to stay straight ahead. 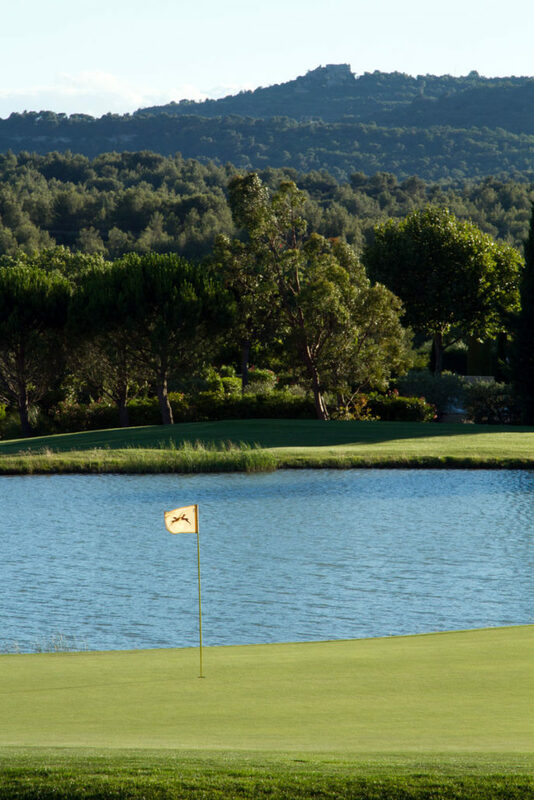 The approach must be precise to avoid the bunkers to the right and the water hazard on the left. 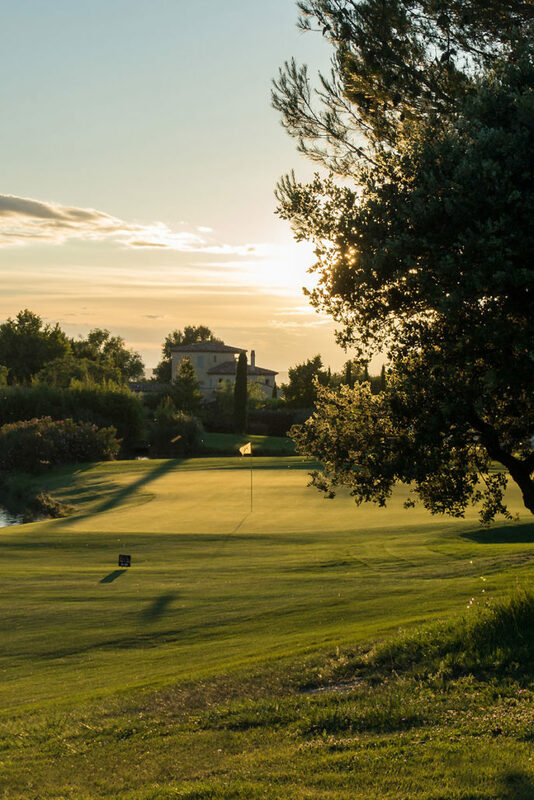 When the Mistral is blowing it forces you to aim for the right of the green, if not, to your great surprise the water may swallow your ball on such a simple approach shot.